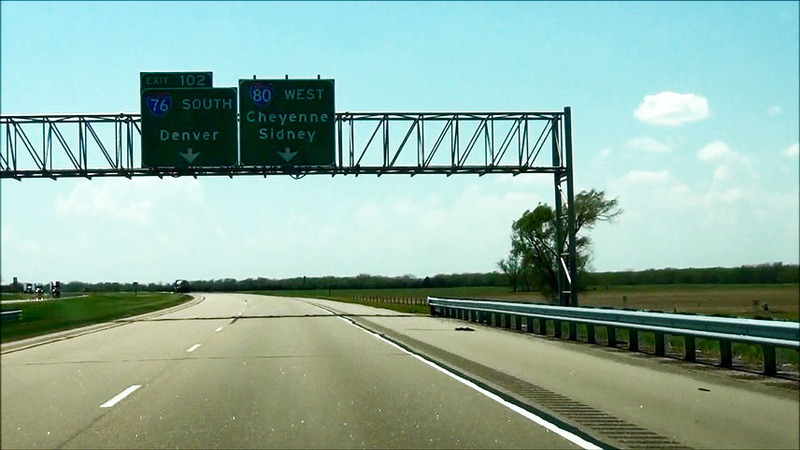 Interstate 80 West as it crosses the Missouri River and enters Nebraska from Iowa. (Photo taken 5/17/13). 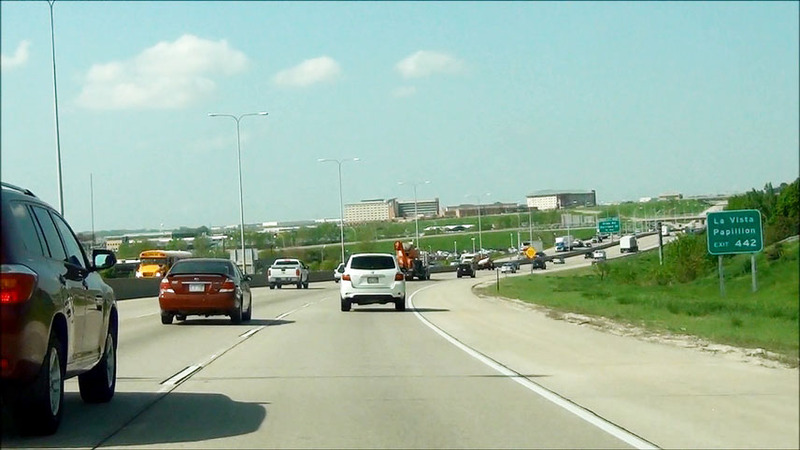 Interstate 80 West at Exit 454: 13th Street / Henry Doorly Zoo / Lauritzen Gardens (Photo taken 5/17/13). 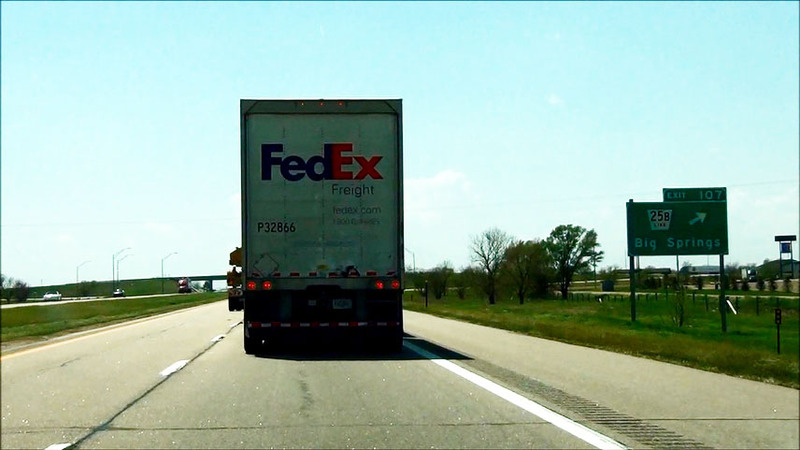 Follow US 75 North via Exit 452 to Eppley Airfield. (Photo taken 5/17/13). Speed limit sign located near mile marker 453. 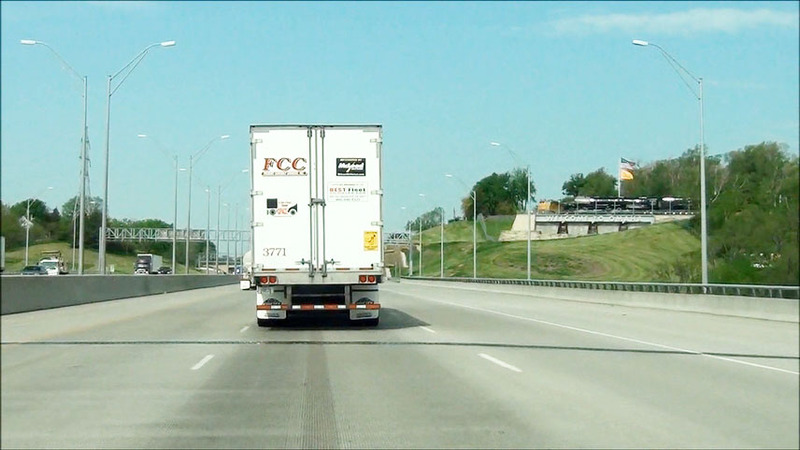 The speed limit on Interstate 80 through the Omaha area is 60 mph. 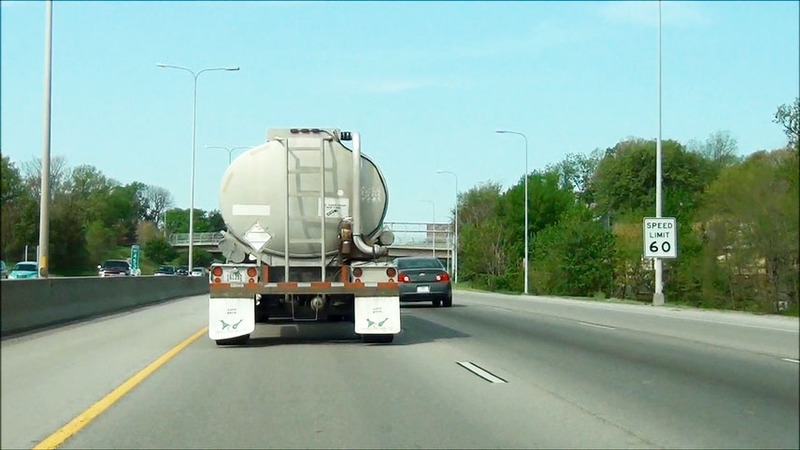 (Photo taken 5/17/13). 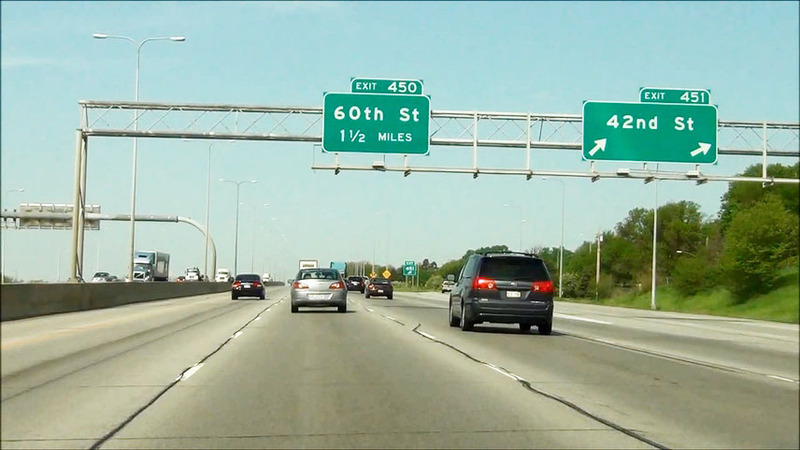 Interstate 80 West at Exit 452: Interstate 480 North / US 75 North - Downtown; US 75 South - Bellevue (Photo taken 5/17/13). 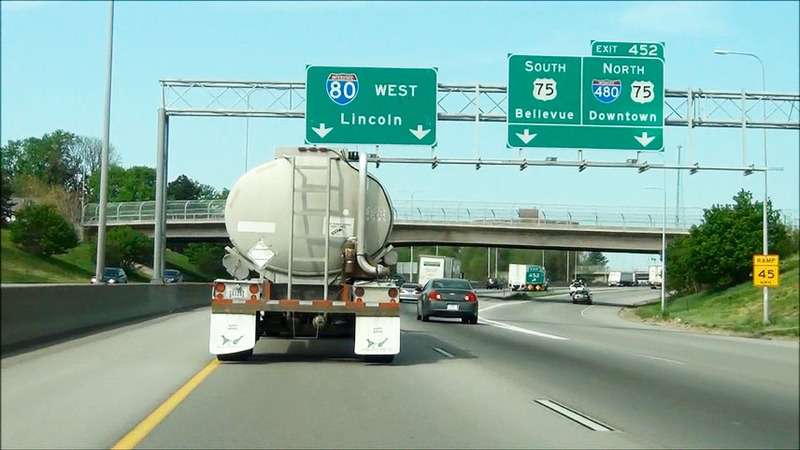 Overhead Interstate 80 West assurance shield located near mile marker 452. (Photo taken 5/17/13). 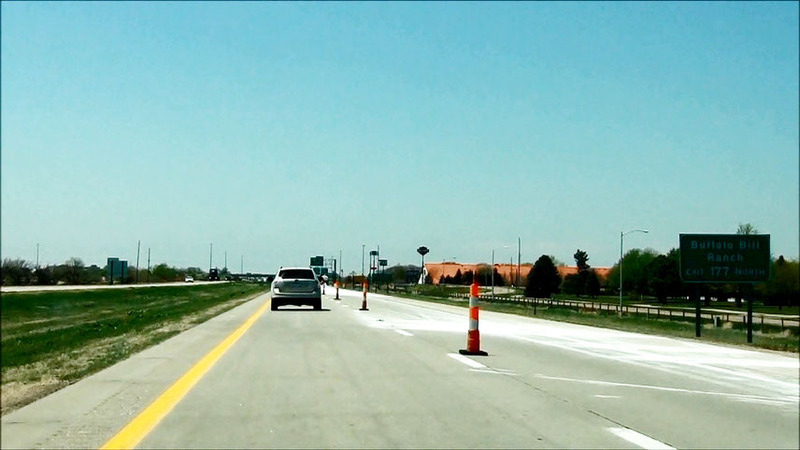 Use Exit 451 to University of Nebraska Medical Center and VA Hospital. (Photo taken 5/17/13). 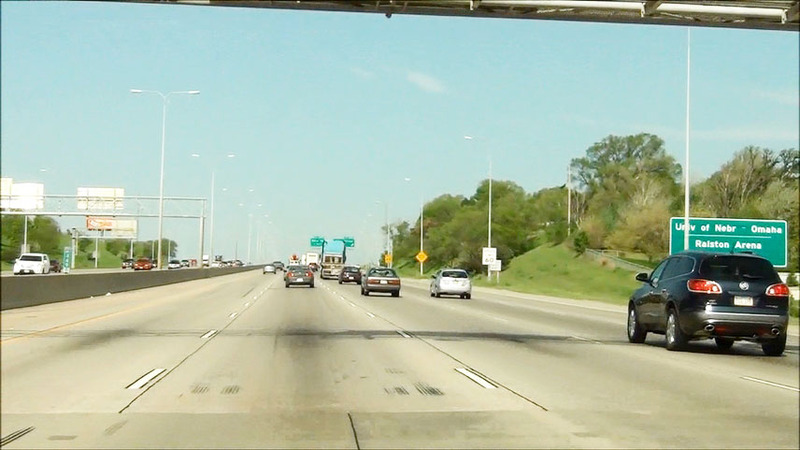 Interstate 80 West at Exit 451: 42nd St (Photo taken 5/17/13). 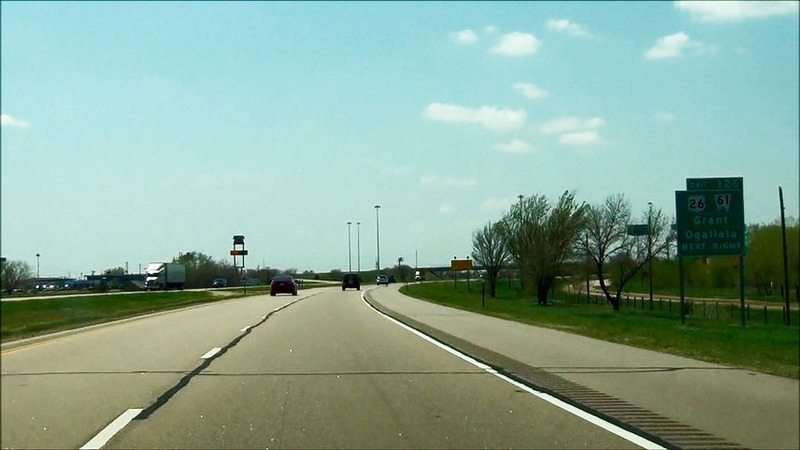 Interstate 80 West at Exit 450: 60th Street (Photo taken 5/17/13). 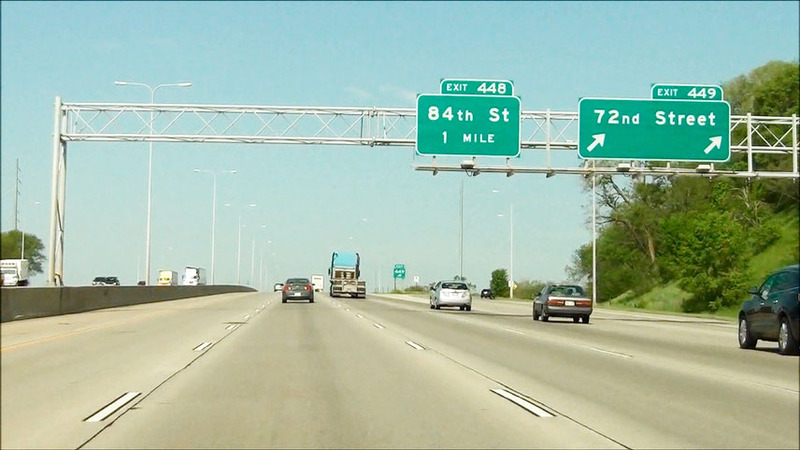 Take Exit 449 to University of Nebraska at Omaha and Ralston Arena. (Photo taken 5/17/13). 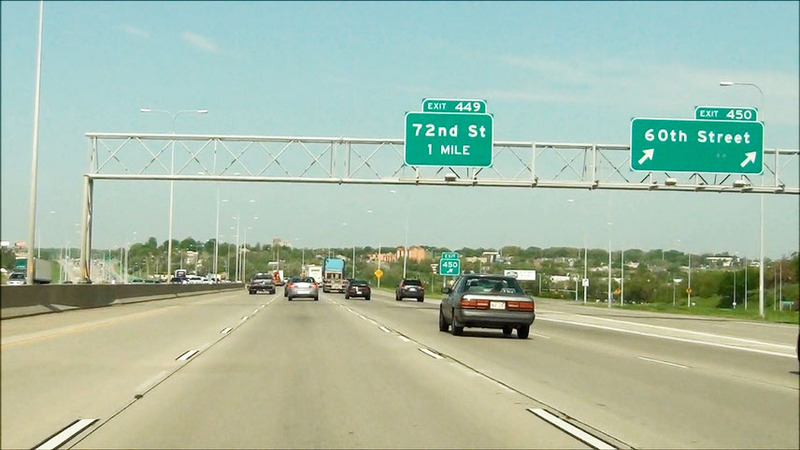 Interstate 80 West at Exit 449: 72nd Street (Photo taken 5/17/13). 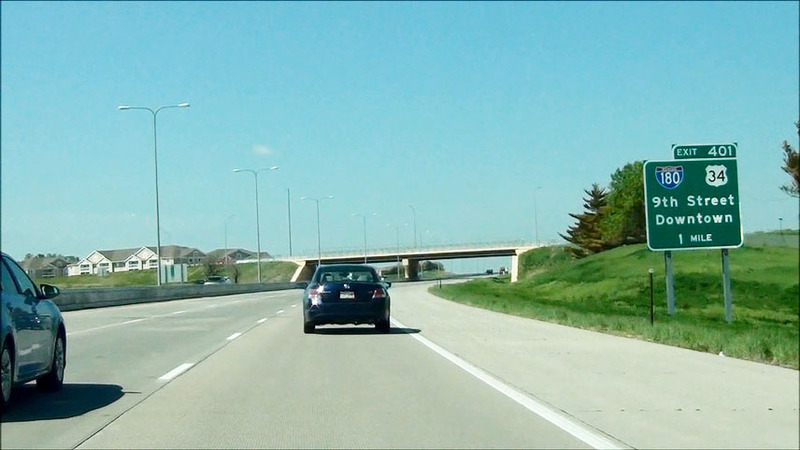 Take Exit 448 to Papillion. (Photo taken 5/17/13). 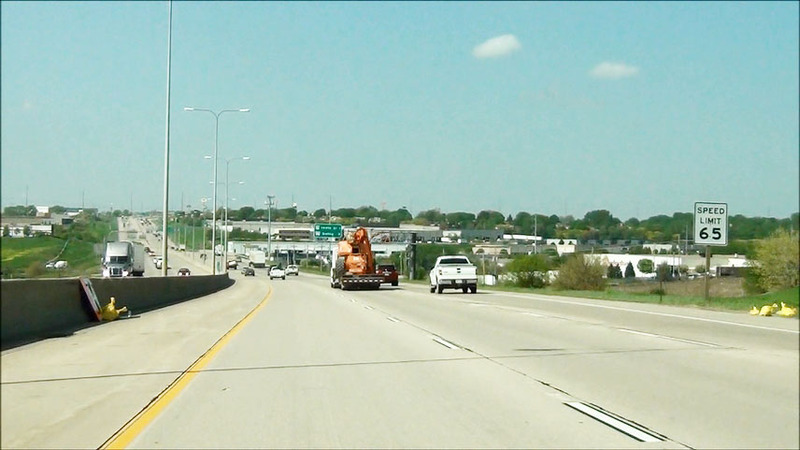 Interstate 80 West at Exit 448: 84th Street (Photo taken 5/17/13). 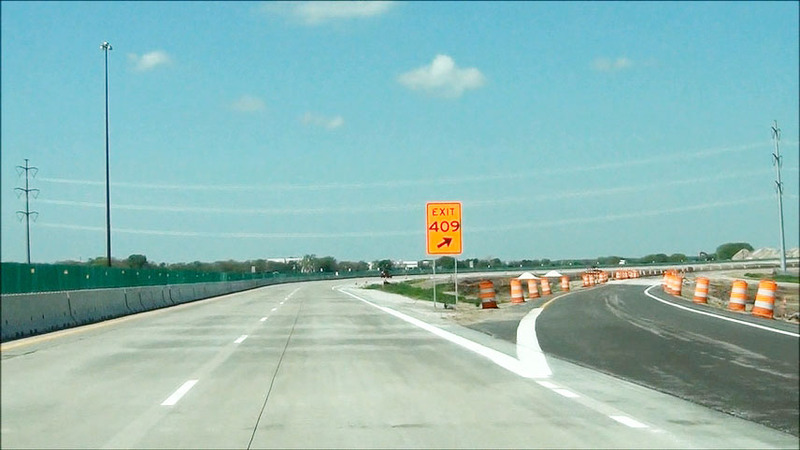 Interstate 80 West at Exit 445: W Center Rd / US 275 / NE 92 / I-L-Q Streets (Photo taken 5/17/13). 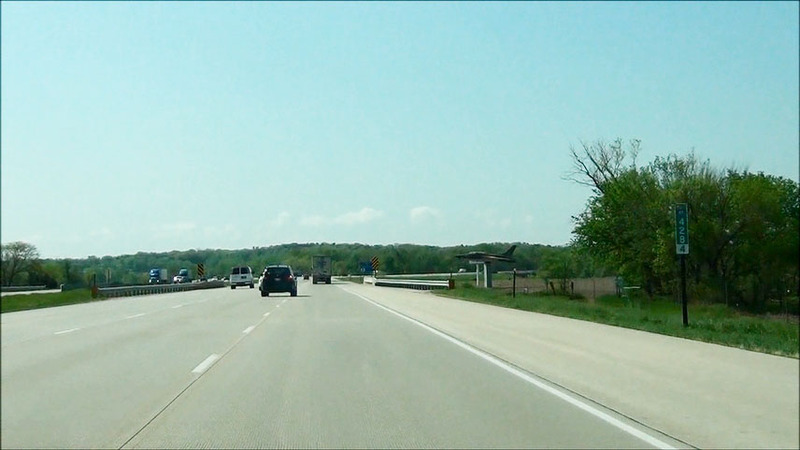 Interstate 80 West at Exit 446: Interstate 680 North (Photo taken 5/17/13). 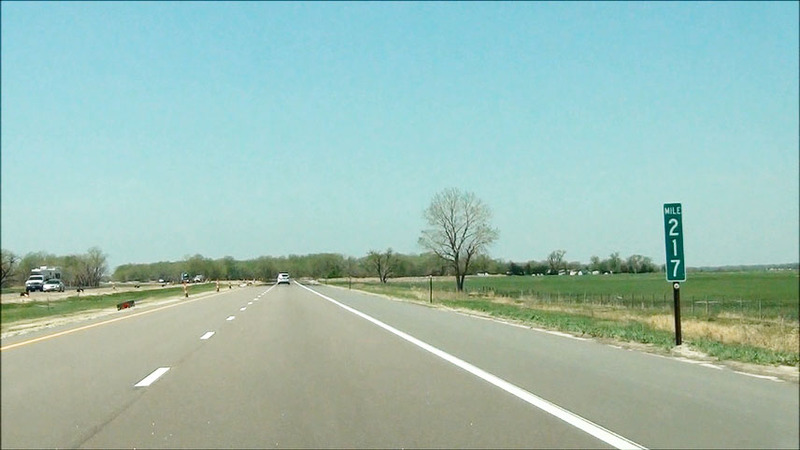 Road view near mile marker 445 as Interstate 80 West curves to the southwest to head toward Lincoln. (Photo taken 5/17/13). 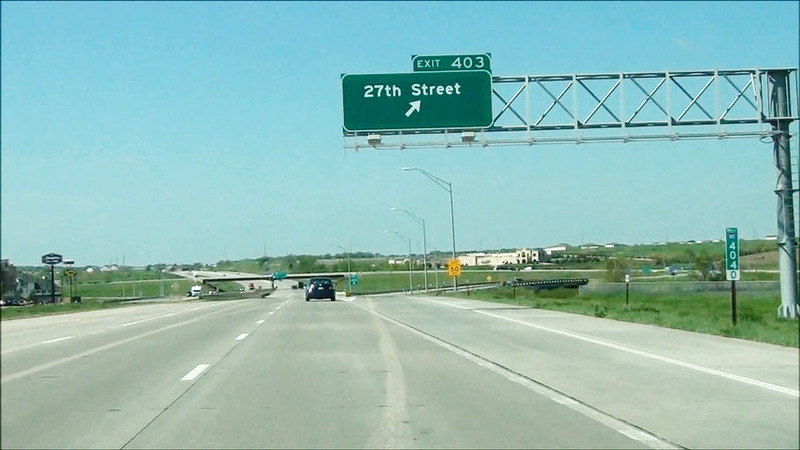 Take Exit 442 to La Vista and Papillion. 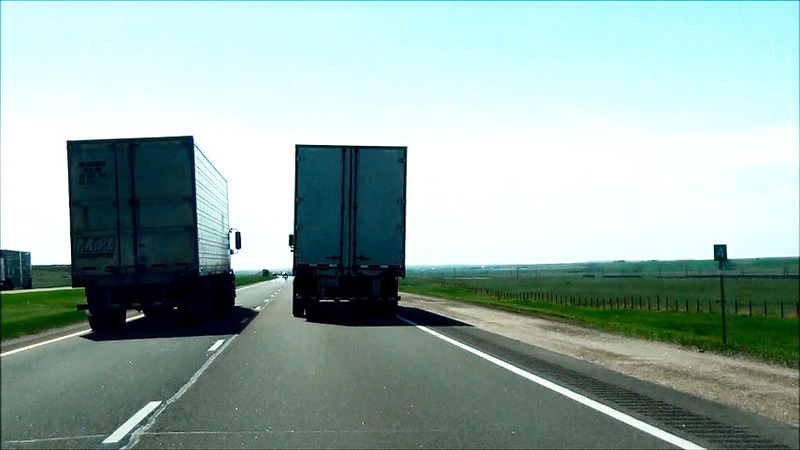 (Photo taken 5/17/13). 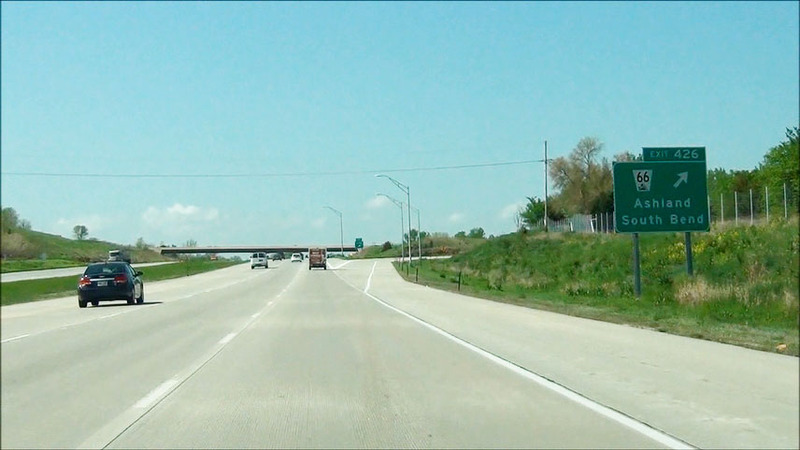 Interstate 80 West at Exit 442: Giles Rd / Harrison St (Photo taken 5/17/13). 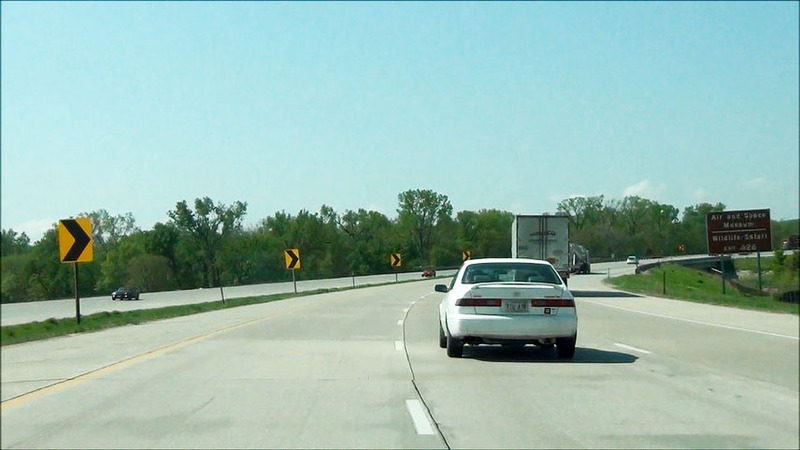 Near mile marker 443, the speed limit increases to 65 mph as you begin to leave the Omaha area. (Photo taken 5/17/13). 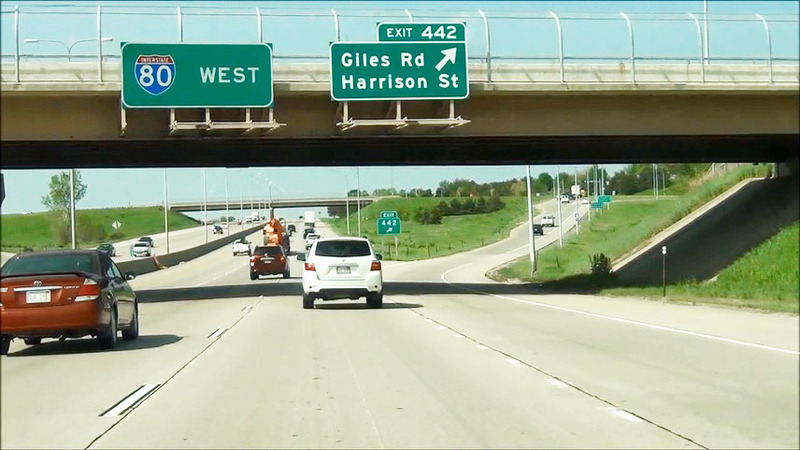 Take Exit 440 to Platte River State Park and Chalco Hills Recreation Area. (Photo taken 5/17/13). 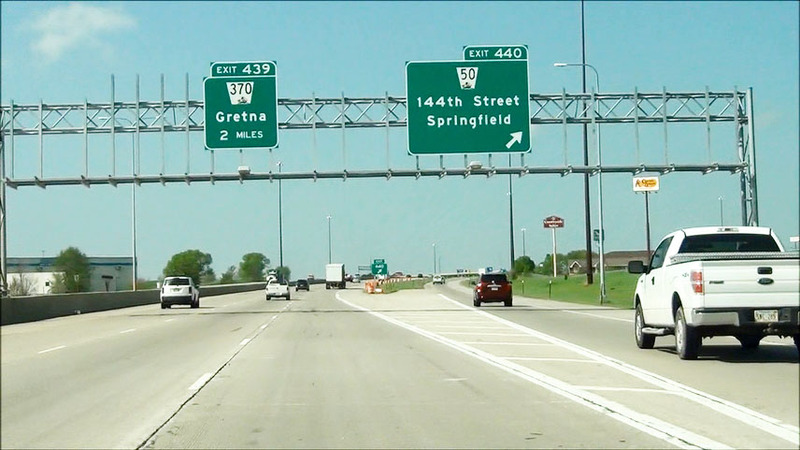 Interstate 80 West at Exit 440: NE 50 - 144th Street / Springfield (Photo taken 5/17/13). 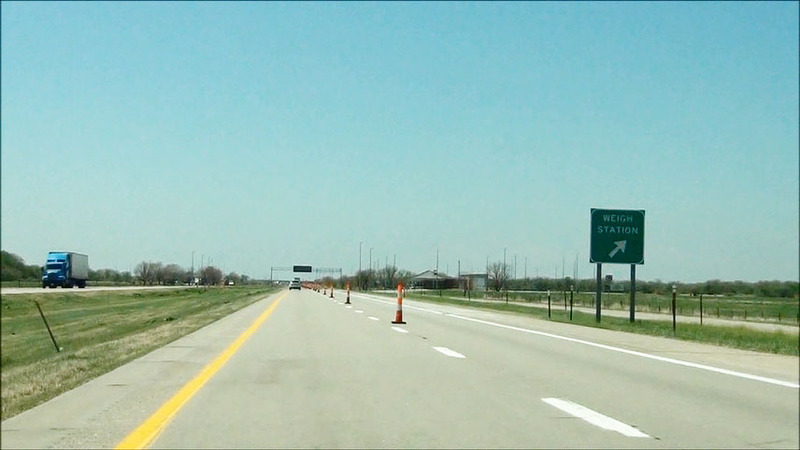 Take Exit 439 to Werner Park. (Photo taken 5/17/13). 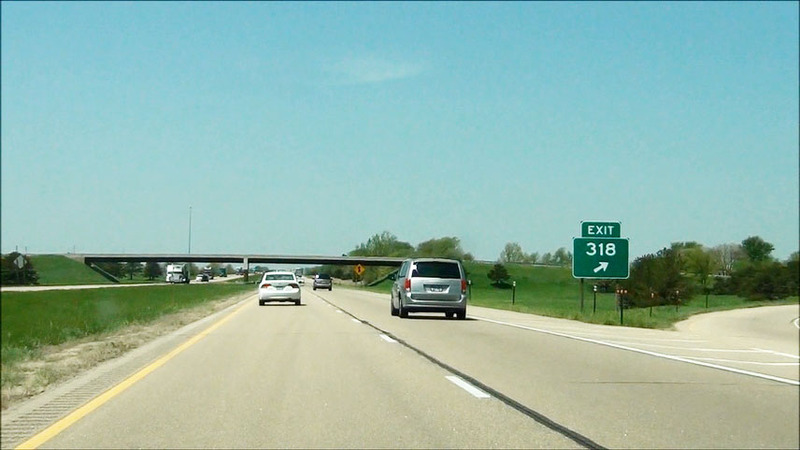 Interstate 80 West at Exit 439: NE 370 - Gretna (Photo taken 5/17/13). 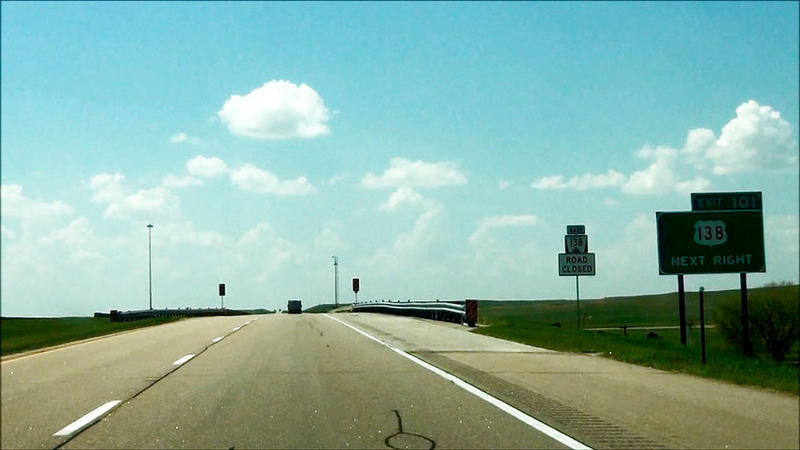 Near mile marker 438, the speed limit increases to 75 mph which is standard on most of Interstate 80 in Nebraska. Hammer down! (Photo taken 5/17/13). Take Exit 432 to Schramm State Park and Holy Family Shrine. 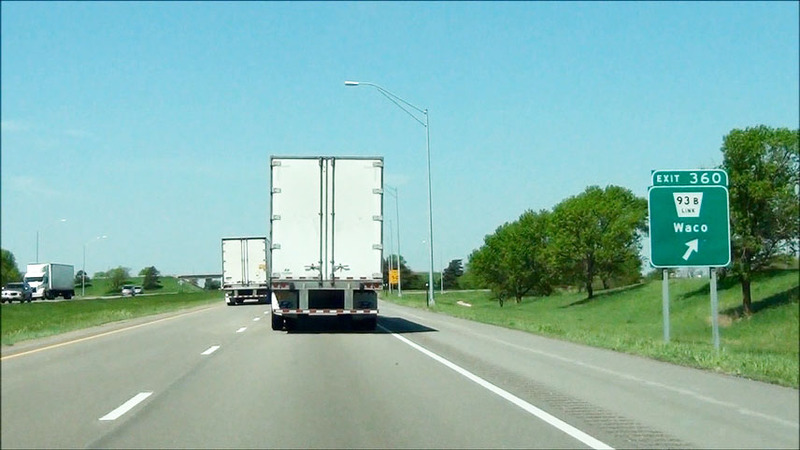 (Photo taken 5/17/13). 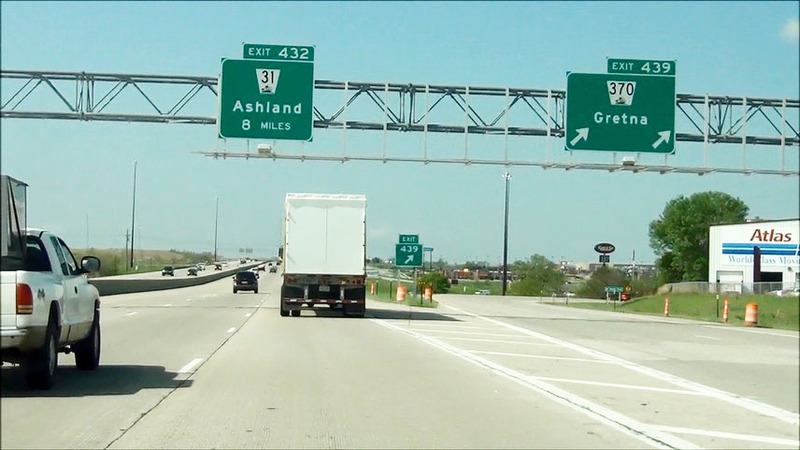 Interstate 80 West at Exit 432: US 6 / NE 31 - Gretna / Ashland (Photo taken 5/17/13). Interstate 80 West shield located at mile marker 432.4. (Photo taken 5/17/13). Mileage sign located at mile marker 432. 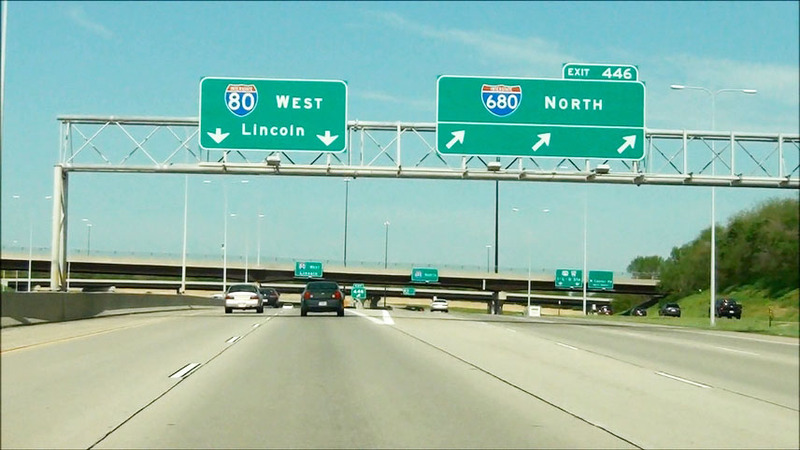 It's 6 miles to the next exit (NE 66) and 34 miles to Lincoln. (Photo taken 5/17/13). 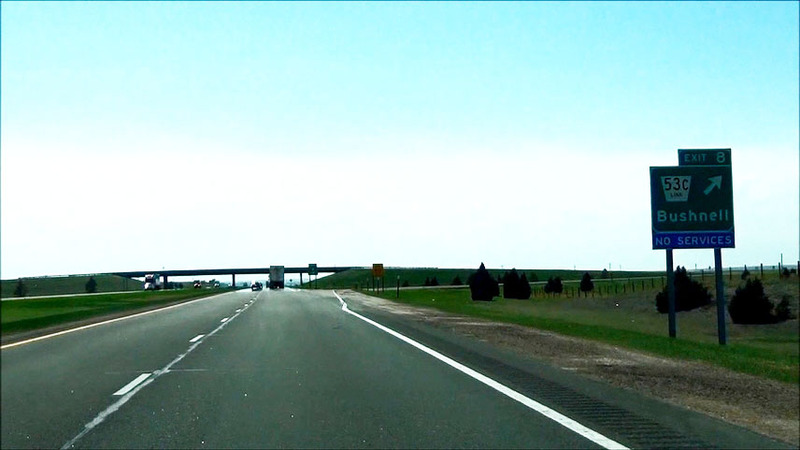 Interstate 80 West at the Rest Area located at mile marker 431.8. (Photo taken 5/17/13). 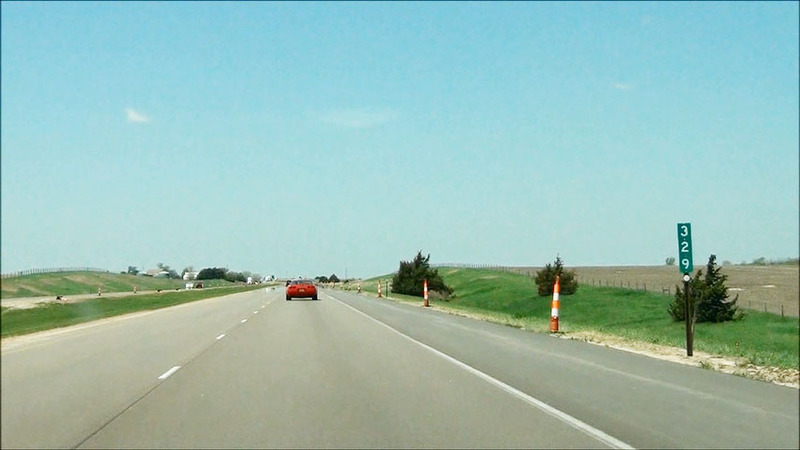 Interstate 80 West: Road view from mile marker 428.4. (Photo taken 5/17/13). Take Exit 426 to Air and Space Museum and Wildlife Safari. (Photo taken 5/17/13). Also take Exit 426 to the nearby State Parks and Attractions. (Photo taken 5/17/13). 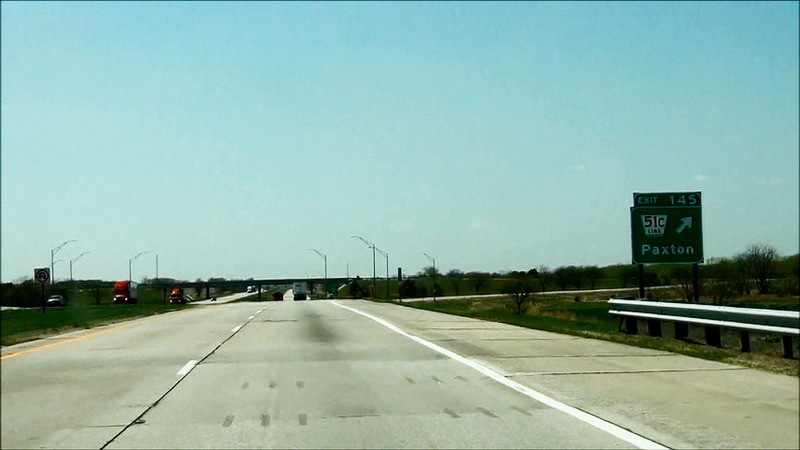 Interstate 80 West at Exit 426: NE 66 - Ashland / South Bend (Photo taken 5/17/13). 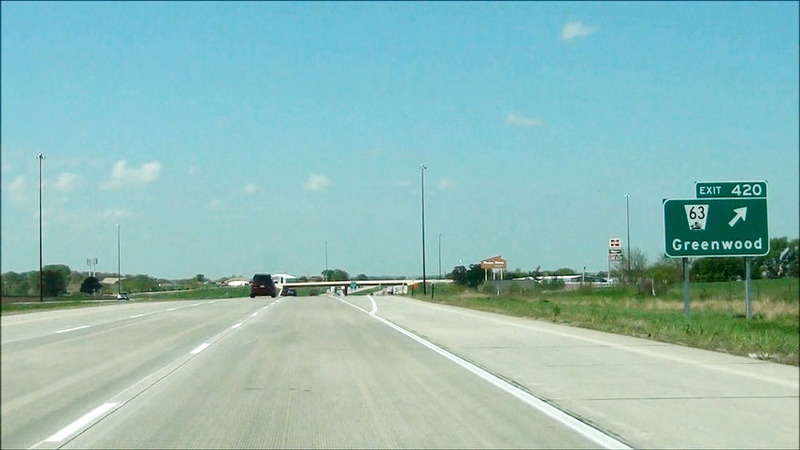 Interstate 80 West at Exit 420: NE 63 - Greenwood (Photo taken 5/17/13). 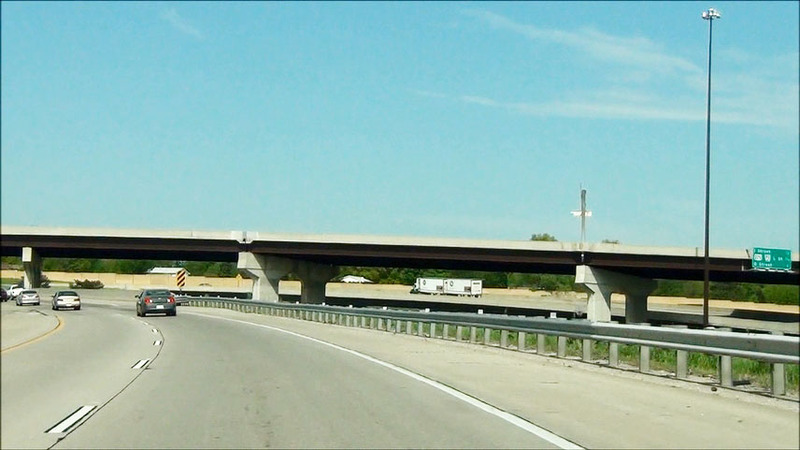 Interstate 80 West at the Weigh Station located at mile marker 416. (Photo taken 5/17/13). 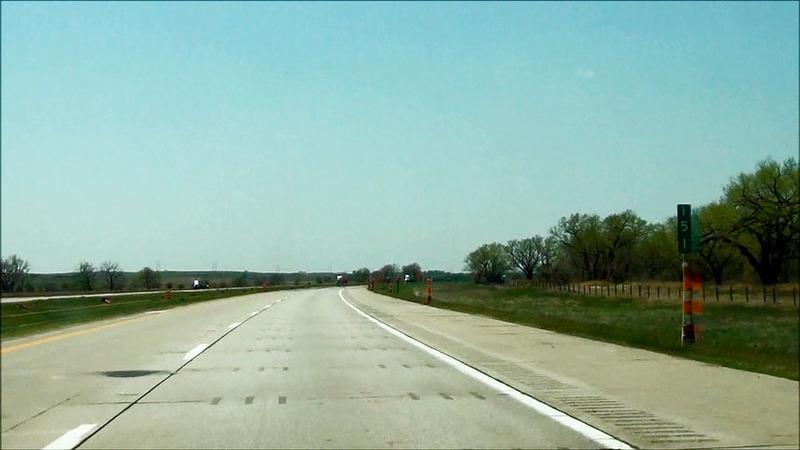 Interstate 80 West: Road view from mile marker 414. (Photo taken 5/17/13). 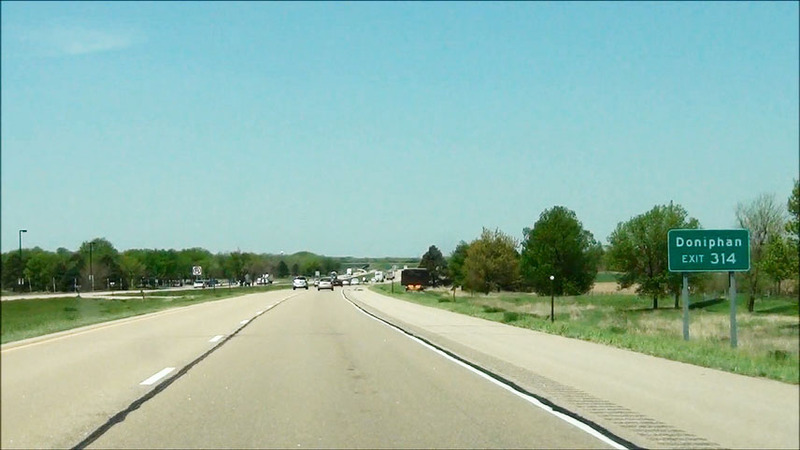 Interstate 80 West at Exit 409: US 6 - Waverly (Photo taken 5/17/13). 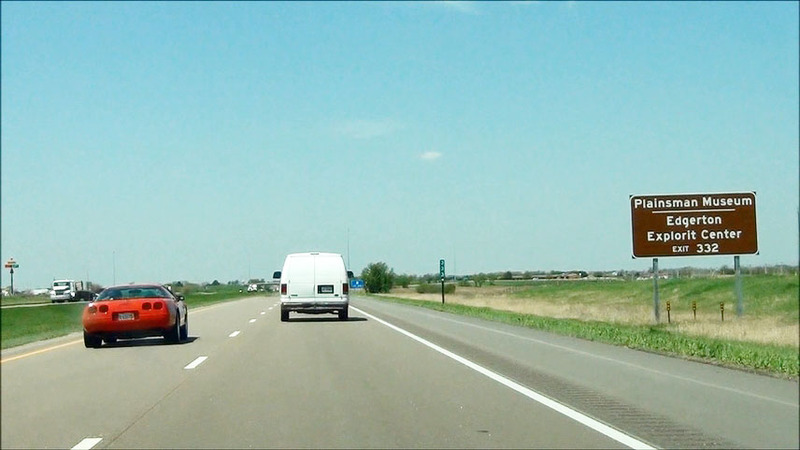 Near mile marker 406, the speed limit drops to 65 mph as you prepare to pass through Lincoln. (Photo taken 5/17/13). 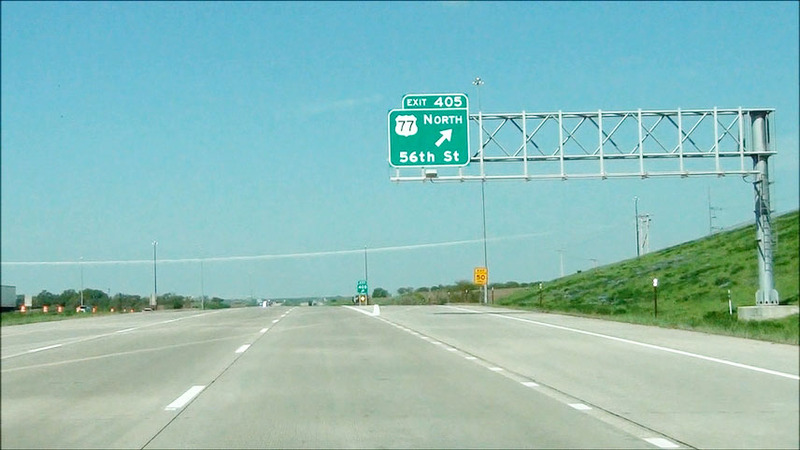 Interstate 80 West at Exit 405: US 77 North - 56th St (Photo taken 5/17/13). 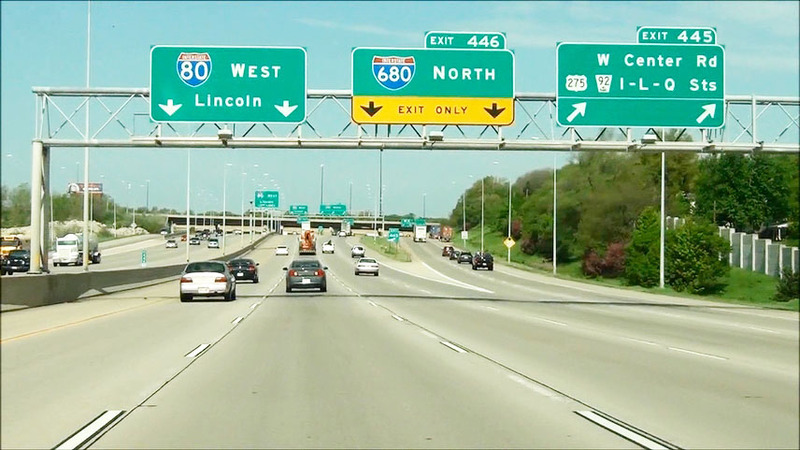 Take Exit 403 to the University of Nebraska, the Zoo, and Museums. (Photo taken 5/17/13). 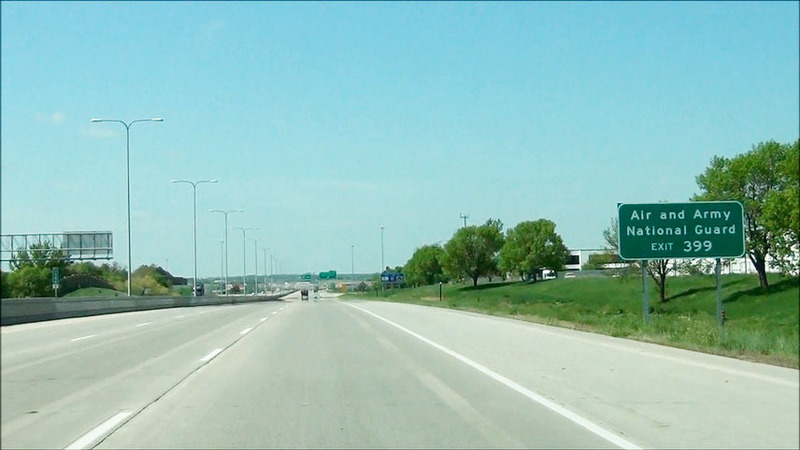 Interstate 80 West at Exit 403: 27th Street (Photo taken 5/17/13). Interstate 80 West approaching Exit 401 - 1 mile. (Photo taken 5/17/13). 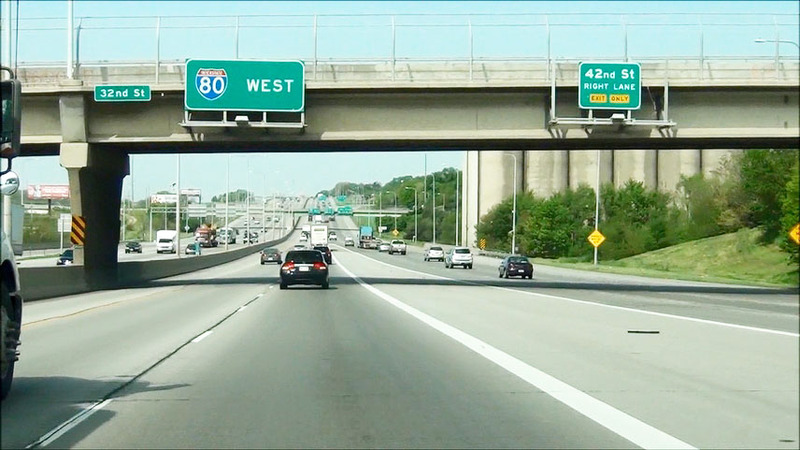 Interstate 80 West at Exit 401: Interstate 180 / US 34 - 9th St / Downtown (Photo taken 5/17/13). Take Exit 399 to Air and Army National Guard. (Photo taken 5/17/13). 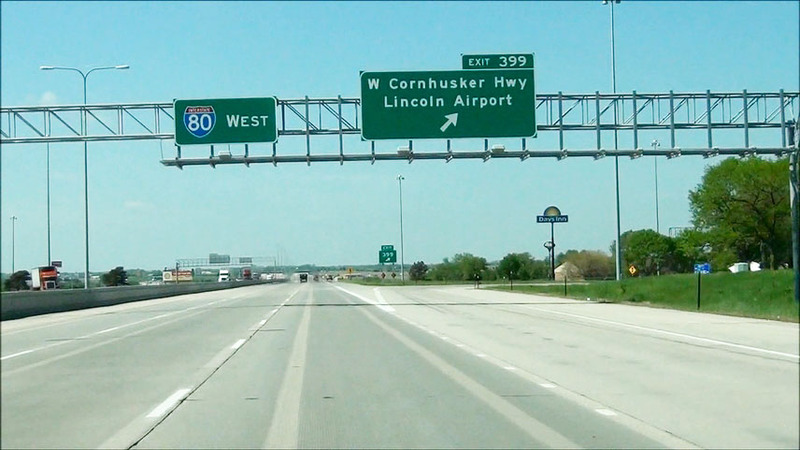 Interstate 80 West at Exit 399: W Cornhusker Hwy / Lincoln Airport (Photo taken 5/17/13). 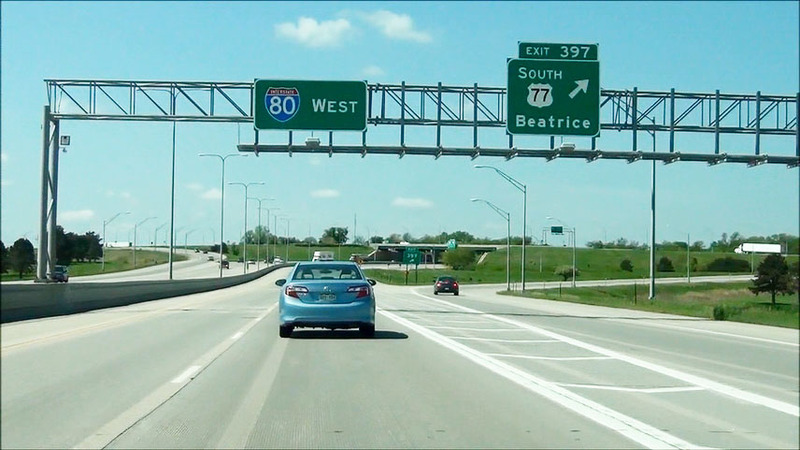 Interstate 80 West at Exit 397: US 77 South - Beatrice (Photo taken 5/17/13). 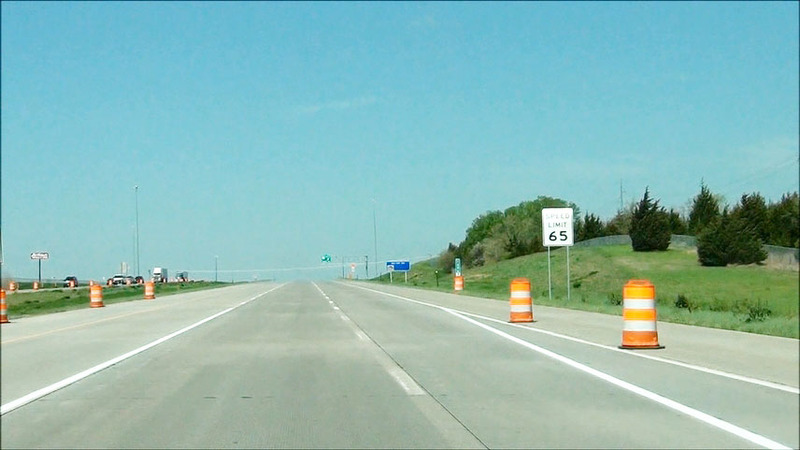 Interstate 80 West at Exit 395: US 6 / Nebraska Link 55K - NW 48th St (Photo taken 5/17/13). 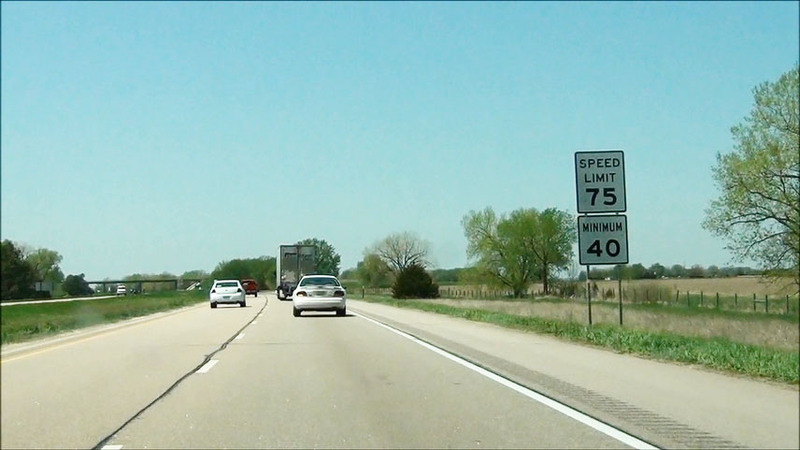 Near mile marker 395, the speed limit increases once again to 75 mph. A 40 mph minimum also applies. 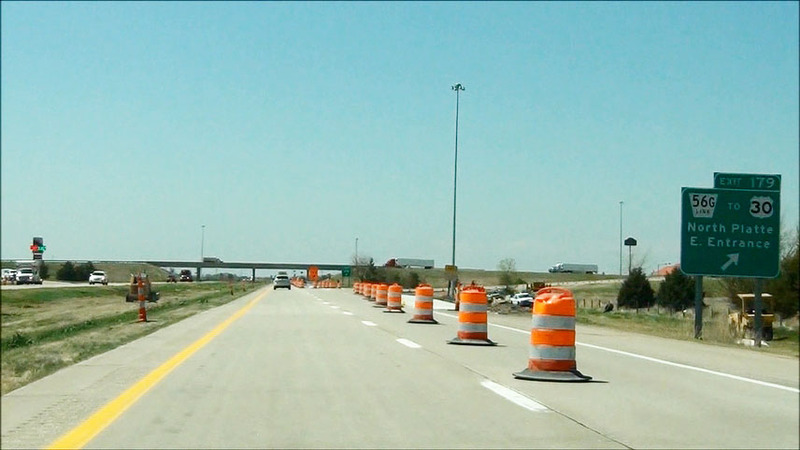 With the exception of construction zones, the speed limit remains 75 mph from here all the way to the Wyoming border. (Photo taken 5/17/13). Mileage sign located near mile marker 395. 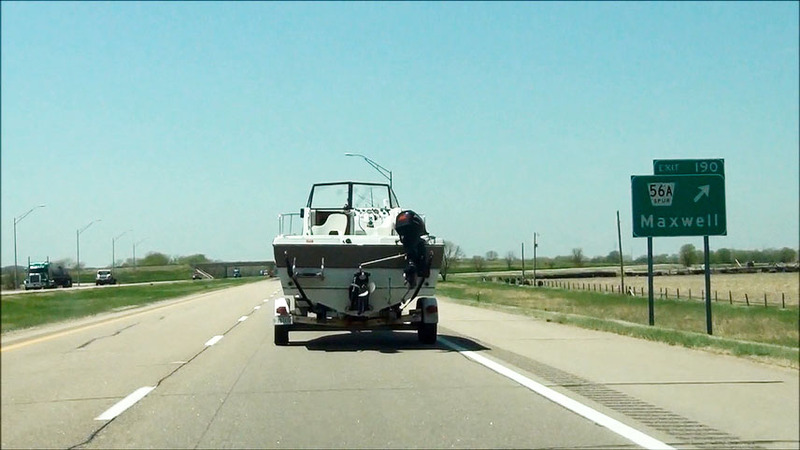 It's 7 miles to the next exit and 88 miles to Grand Island. (Photo taken 5/17/13). 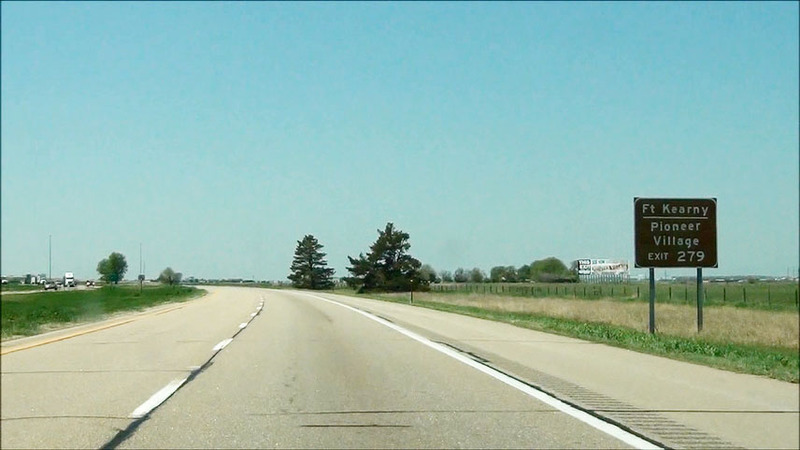 Interstate 80 West: Road view from mile marker 391. (Photo taken 5/17/13). 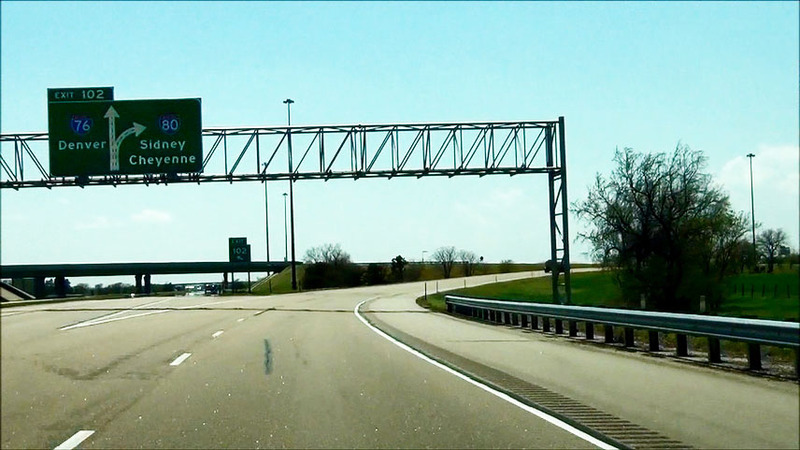 Take Exit 388 to Doane College. (Photo taken 5/17/13). 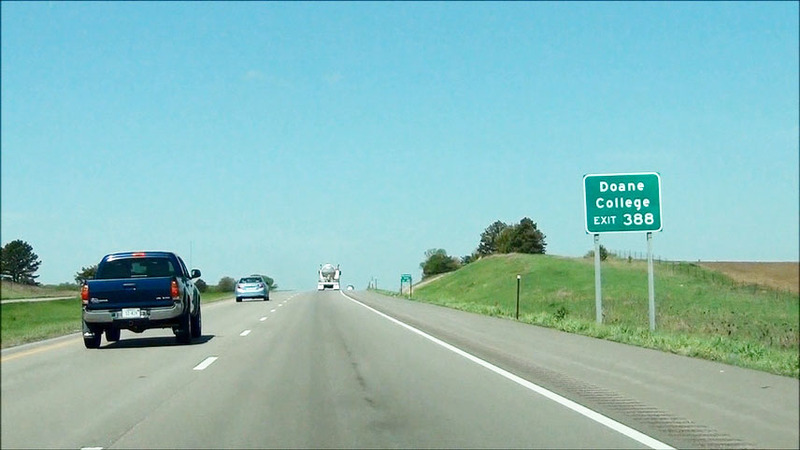 Also take Exit 388 to the town of Pleasant Dale. (Photo taken 5/17/13). 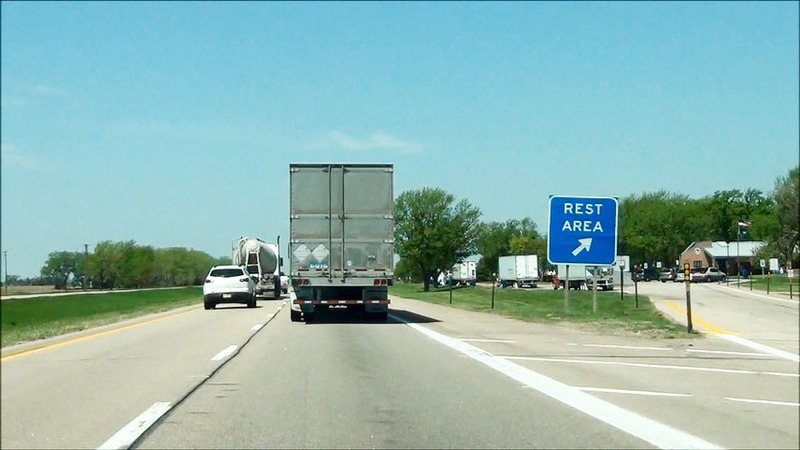 Interstate 80 West at Exit 388: NE 103 - Crete (Photo taken 5/17/13). Take Exit 382 to Southeast Community College. (Photo taken 5/17/13). 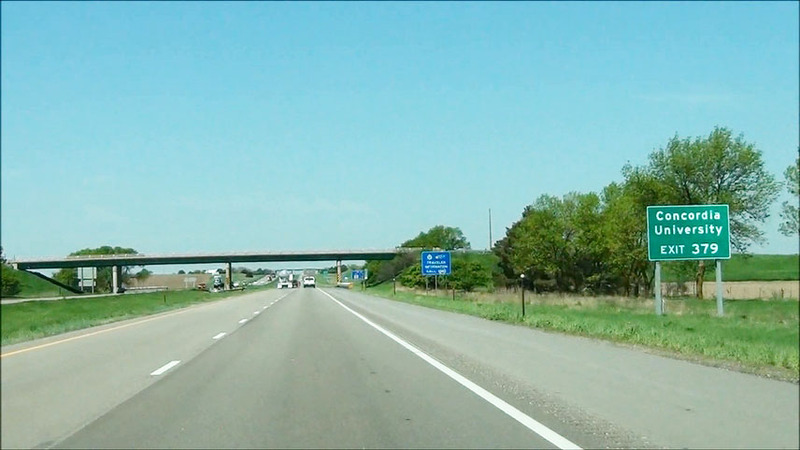 Interstate 80 West at Exit 382: US 6 - Milford (Photo taken 5/17/13). 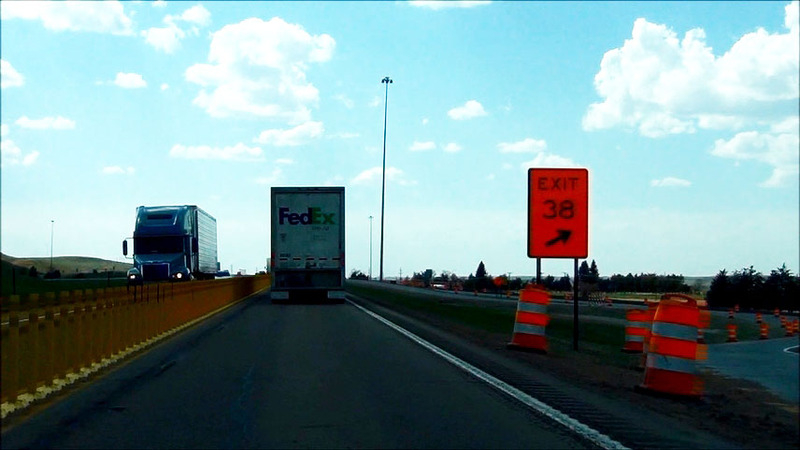 Take Exit 379 to Concordia University. (Photo taken 5/17/13). 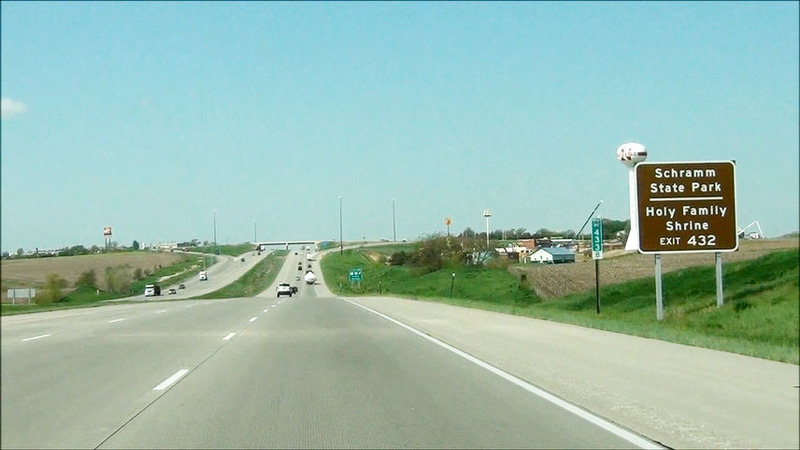 Interstate 80 West at Exit 379: NE 15 - Seward / Fairbury (Photo taken 5/17/13). 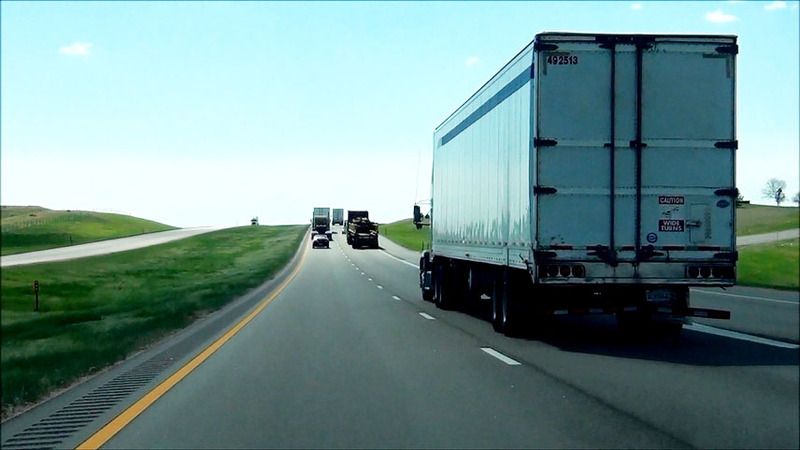 Interstate 80 West at the Truck Parking Area located near mile marker 375. (Photo taken 5/17/13). 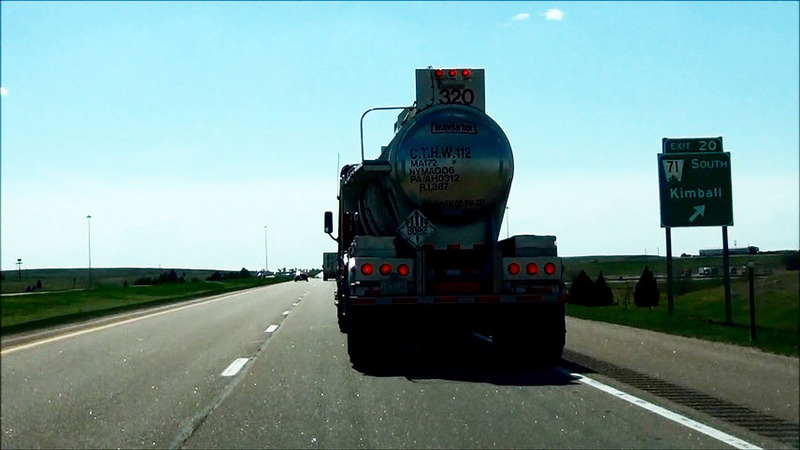 Interstate 80 West at Exit 373: Nebraska Link 80G - Goehner (Photo taken 5/17/13). Take Exit 369 to the town of Friend. (Photo taken 5/17/13). 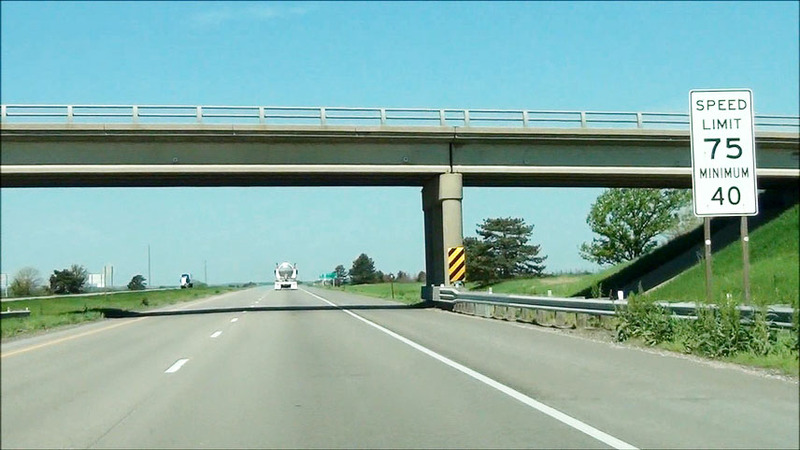 Interstate 80 West at Exit 369: Nebraska Link 80E - Beaver Crossing (Photo taken 5/17/13). Take Exit 366 to the town of Cordova. (Photo taken 5/17/13). 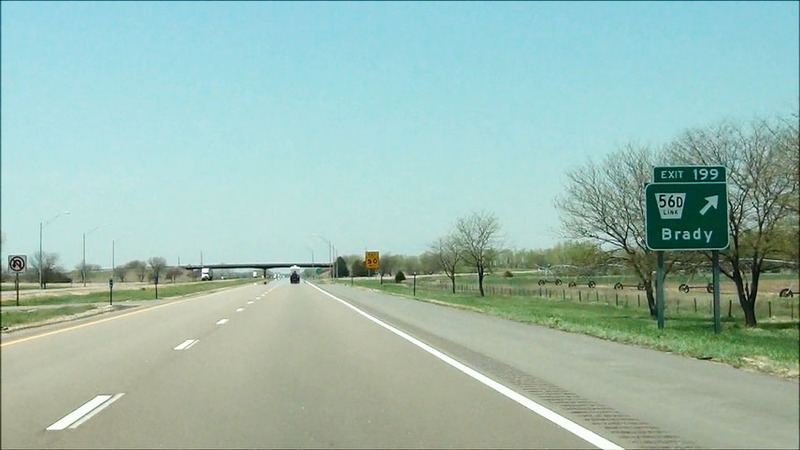 Interstate 80 West at Exit 366: Nebraska Link 80F - Utica (Photo taken 5/17/13). 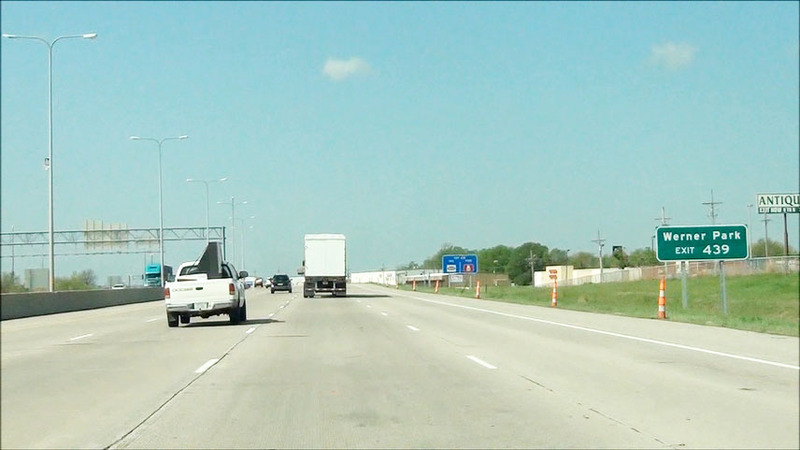 Interstate 80 West at Exit 360: Nebraska Link 93B - Waco (Photo taken 5/17/13). 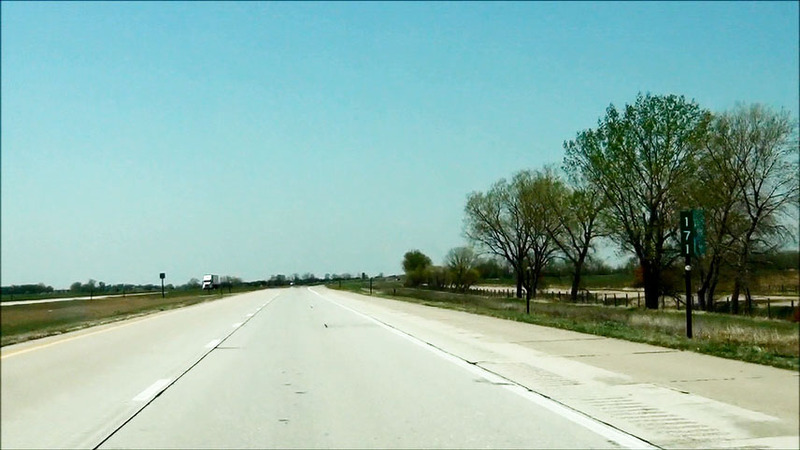 Interstate 80 West: Road view from mile marker 358. (Photo taken 5/17/13). 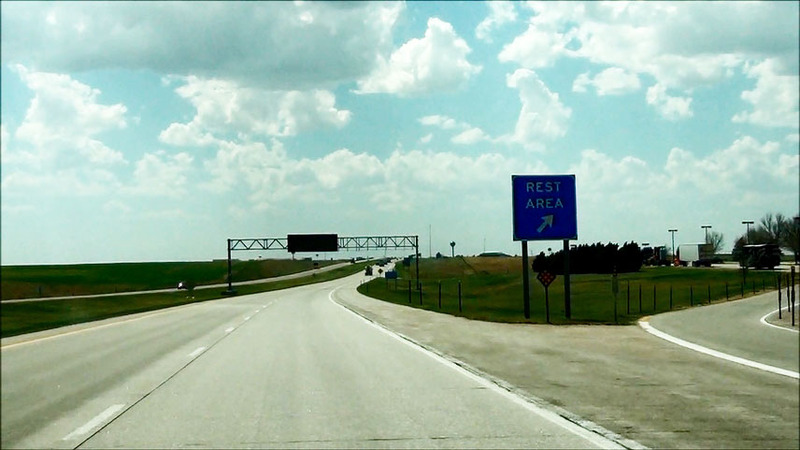 Interstate 80 West at the Rest Area located near mile marker 355. (Photo taken 5/17/13). Interstate 80 West approaching Exit 353 - 1 mile. (Photo taken 5/17/13). 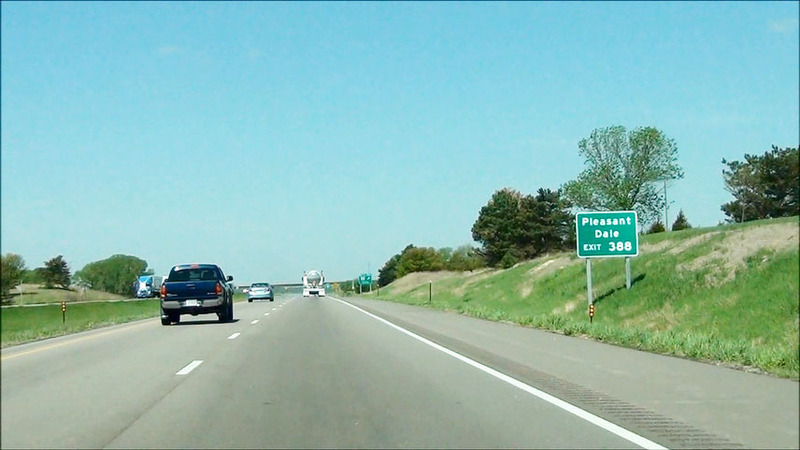 Interstate 80 West at Exit 353: US 81 - York / Geneva (Photo taken 5/17/13). 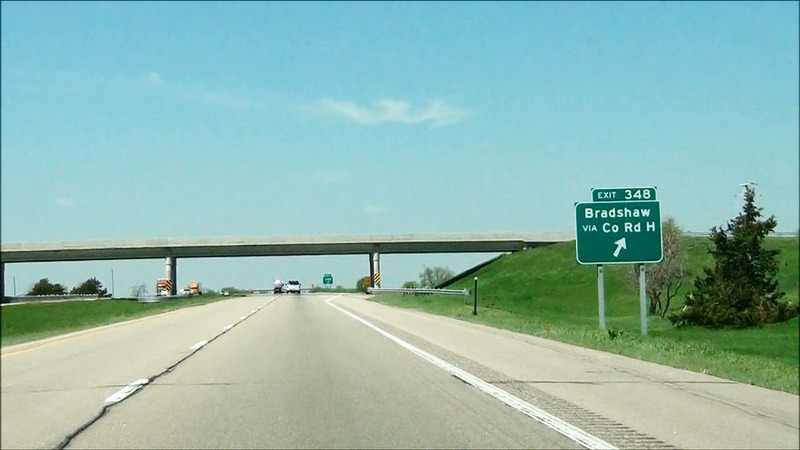 Interstate 80 West at Exit 348: Bradshaw / CR H (Photo taken 5/17/13). Take Exit 342 to the town of Sutton. (Photo taken 5/17/13). 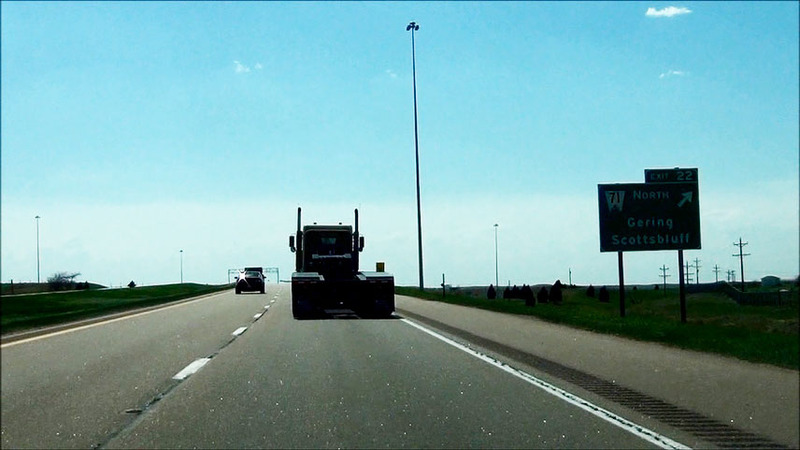 Interstate 80 West at Exit 342: Nebraska Spur 93A - Henderson (Photo taken 5/17/13). 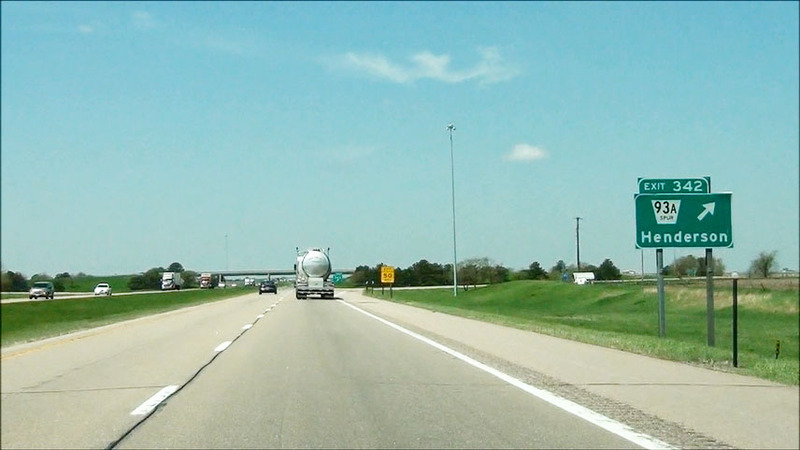 Interstate 80 West at Exit 338: Nebraska Link 41D - Hampton (Photo taken 5/17/13). Take Exit 332 to Plainsman Museum and Edgerton Explorit Center. (Photo taken 5/17/13). 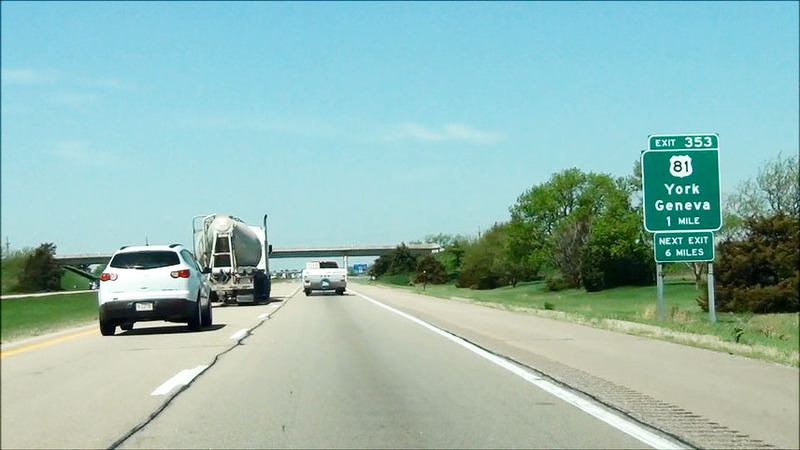 Interstate 80 West at Exit 332: NE 14 - Aurora (Photo taken 5/17/13). 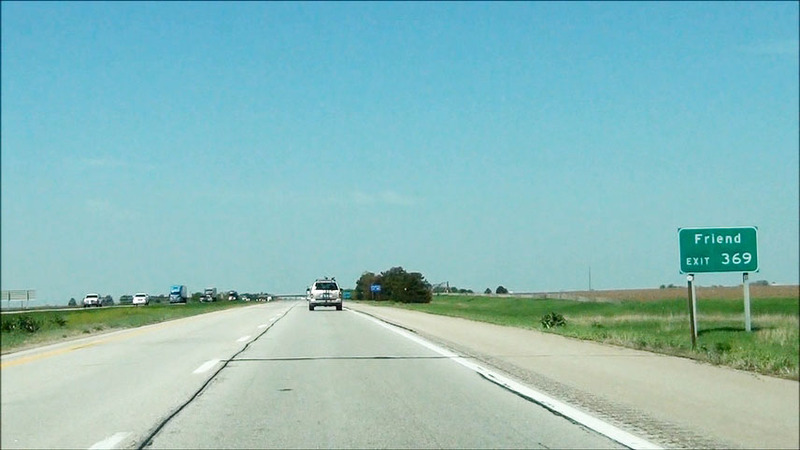 Interstate 80 West: Road view from mile marker 329. (Photo taken 5/17/13). 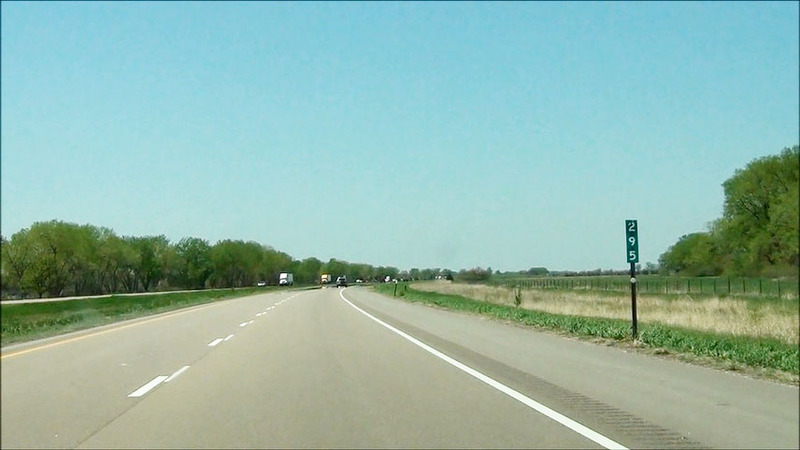 Interstate 80 West at Exit 324: Nebraska Spur 41B - Giltner (Photo taken 5/17/13). 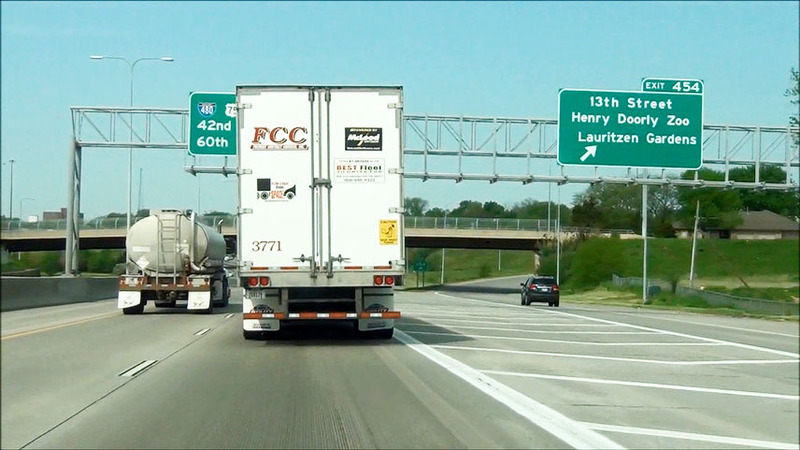 Sign listing the distances to the upcoming Grand Island exits. (Photo taken 5/17/13). Interstate 80 West approaching Exit 318 - 1 mile. (Photo taken 5/17/13). 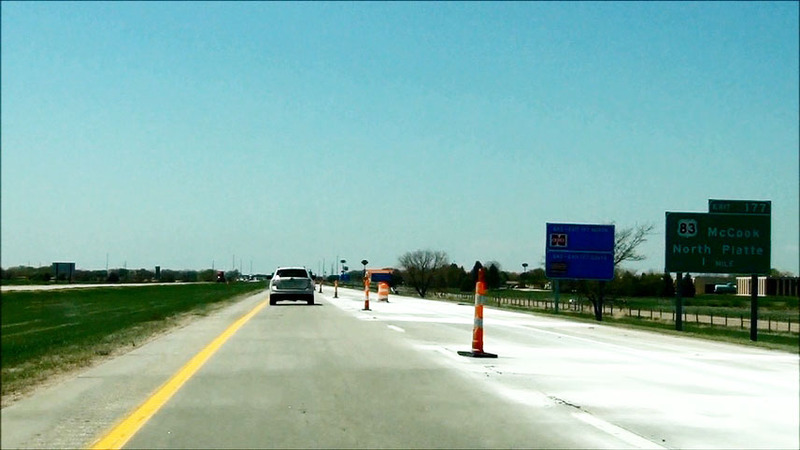 Interstate 80 West at Exit 318: NE 2 West - Grand Island (Photo taken 5/17/13). 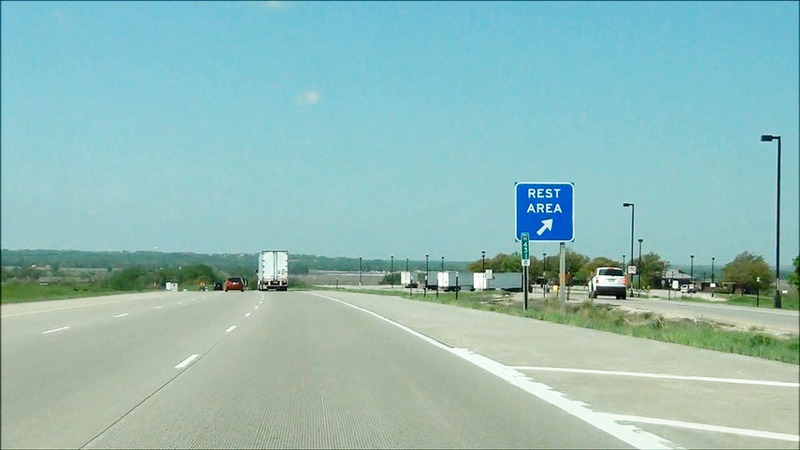 Interstate 80 West at the Rest Area located near mile marker 316. (Photo taken 5/17/13). 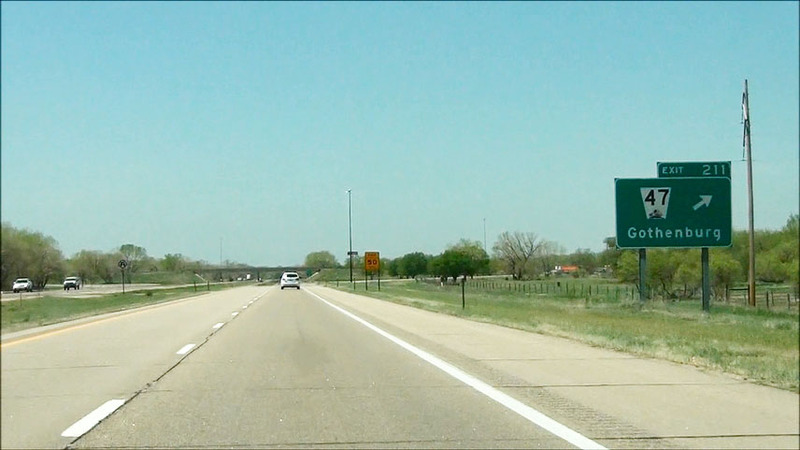 Take Exit 314 to Fonner Park. (Photo taken 5/17/13). 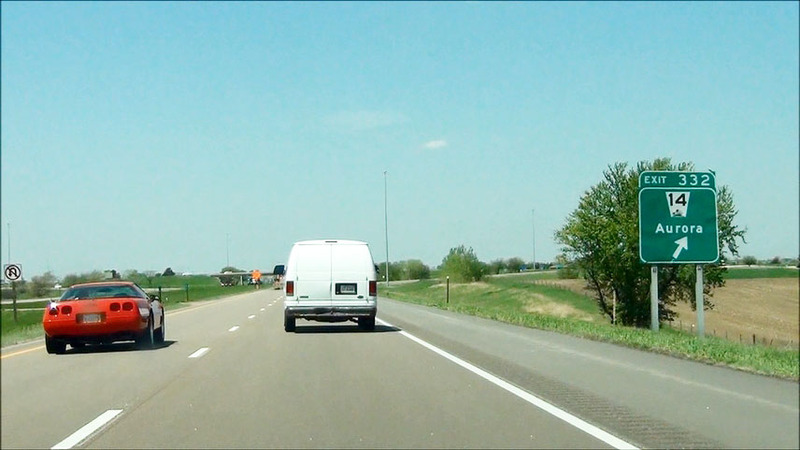 Also take Exit 314 to Doniphan. (Photo taken 5/17/13). 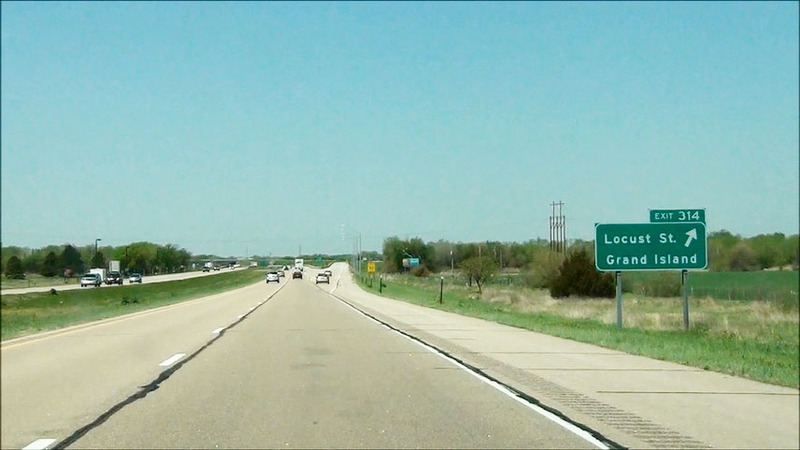 Interstate 80 West at Exit 314: Locust St. / Grand Island (Photo taken 5/17/13). 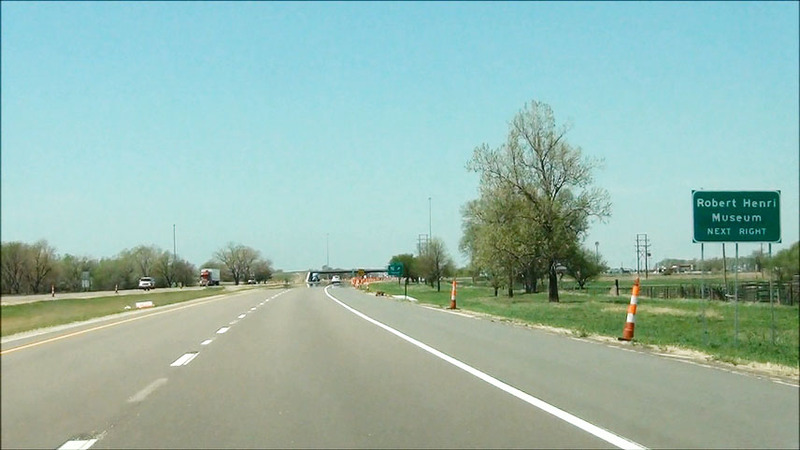 Take Exit 312 to Mormon Island State Recreation Area and Regional Airport. (Photo taken 5/17/13). 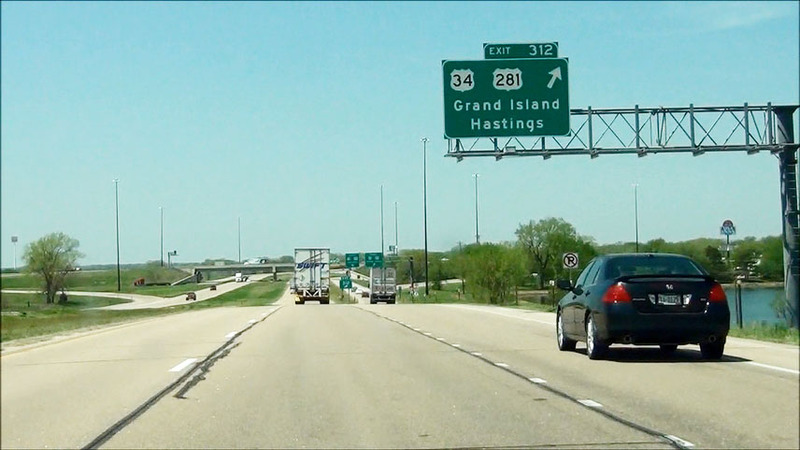 Interstate 80 West at Exit 312: US 34 / US 281 - Grand Island / Hastings (Photo taken 5/17/13). 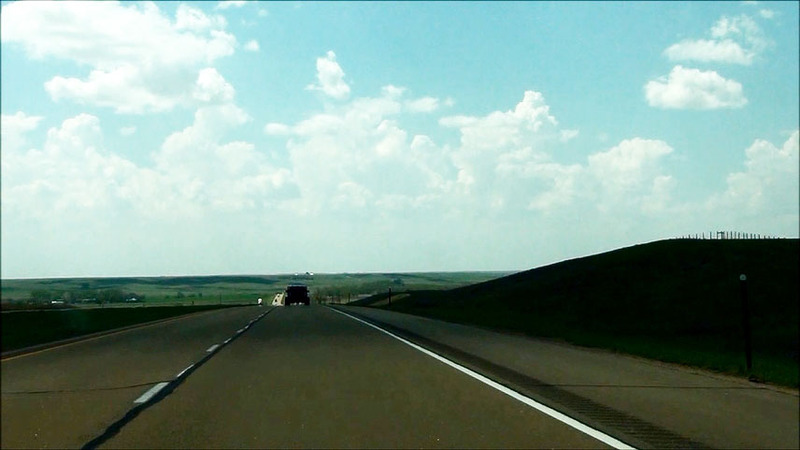 Interstate 80 West: Road view from mile marker 307. (Photo taken 5/17/13). Take Exit 305 to Crane Trust Nature & Visitor Center. (Photo taken 5/17/13). 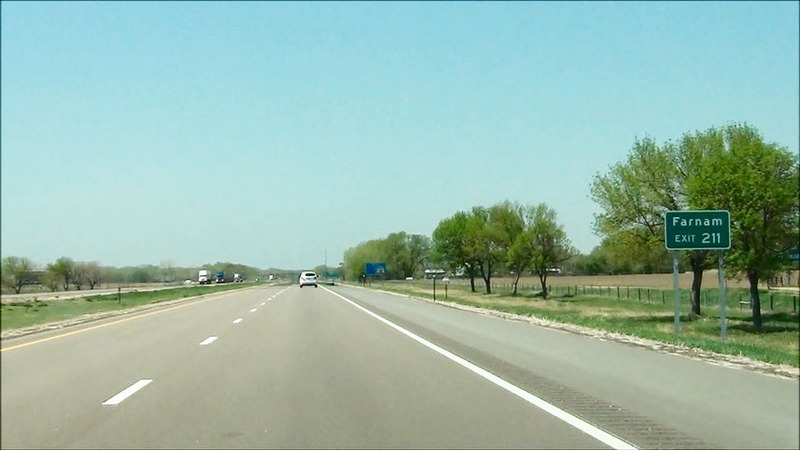 Interstate 80 West at Exit 305: Nebraska Link 40C - Alda (Photo taken 5/17/13). 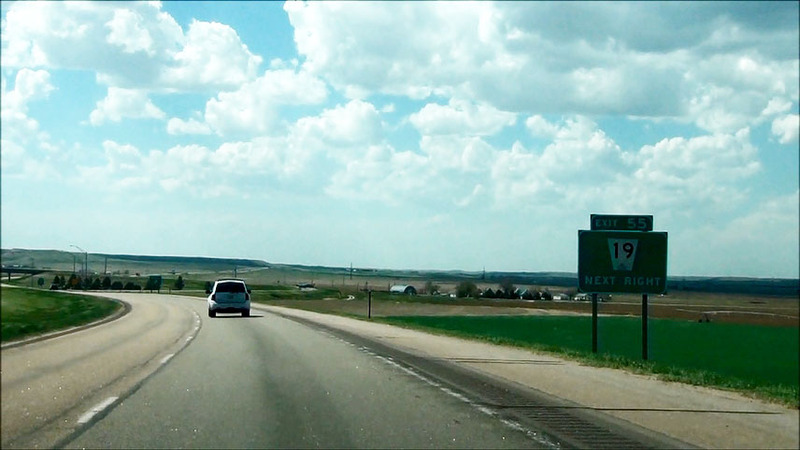 Take Exit 300 to Cheyenne State Recreation Area. (Photo taken 5/17/13). 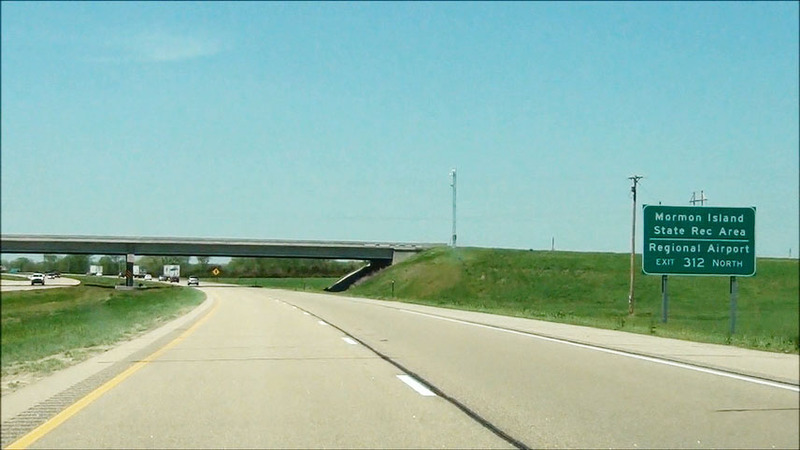 Interstate 80 West at Exit 300: NE 11 - Wood River (Photo taken 5/17/13). 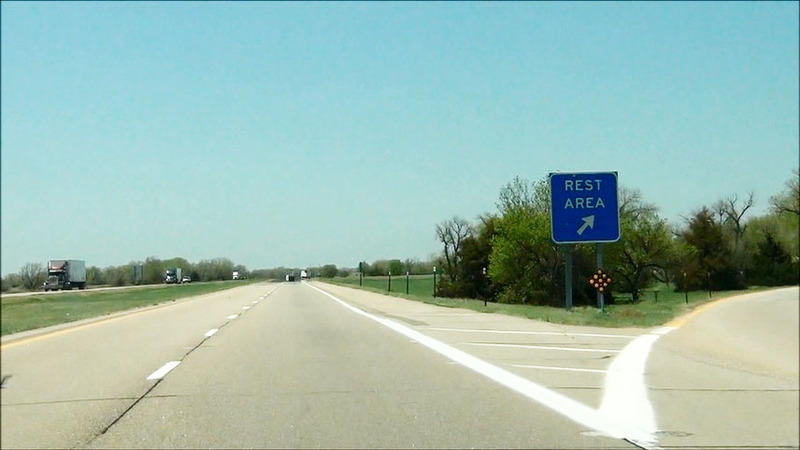 Interstate 80 West shield located near mile marker 299.5. (Photo taken 5/17/13). 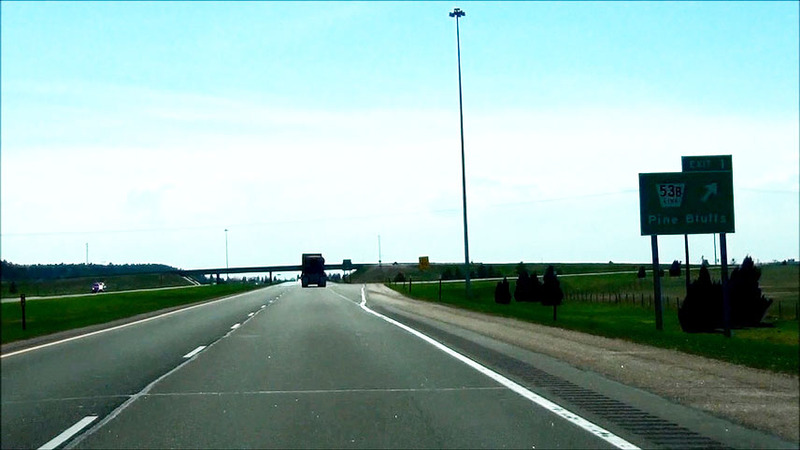 Speed limit signs located near mile marker 299.5. 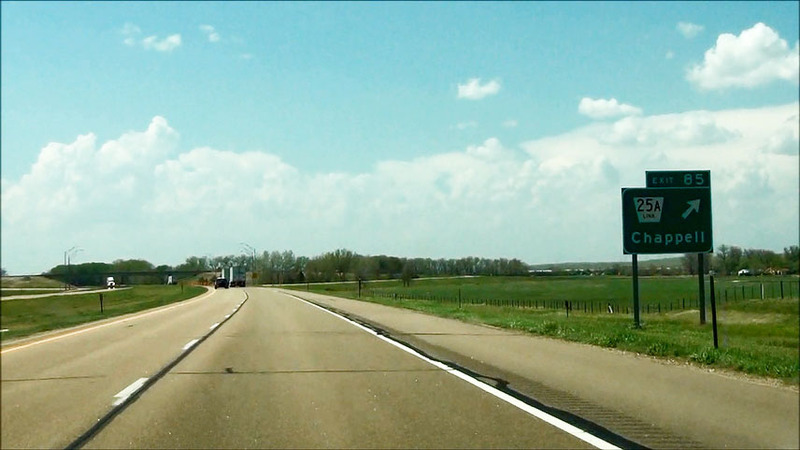 As stated earlier, the speed limit on rural stretches of Interstate 80 in Nebraska is 75 mph with a minimum speed limit of 40 mph. (Photo taken 5/17/13). 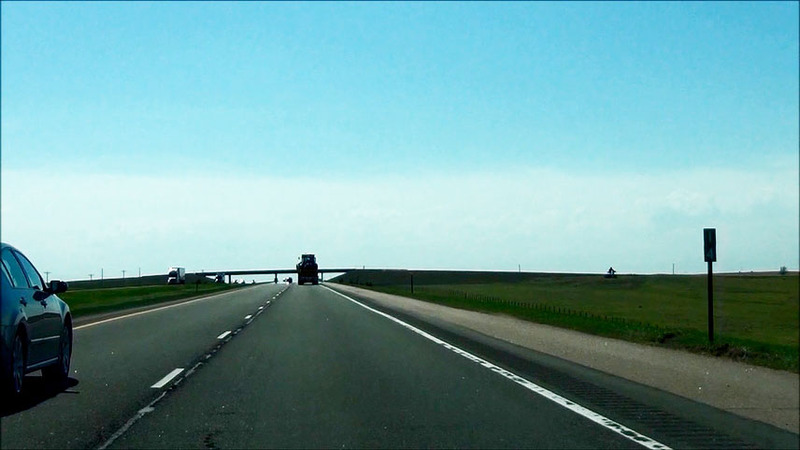 Interstate 80 West: Road view from mile marker 295. (Photo taken 5/17/13). 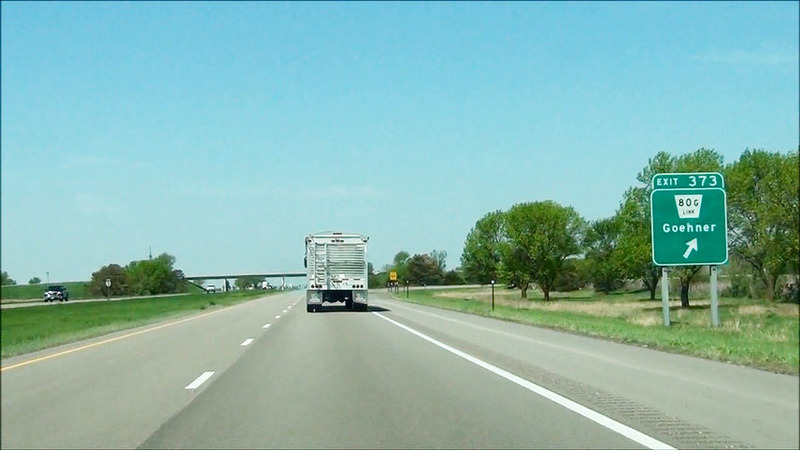 Interstate 80 West at Exit 291: Nebraska Link 10D - Shelton (Photo taken 5/17/13). Take Exit 285 to Windmill State Recreation Area and Rowe Sanctuary & Audubon Center. (Photo taken 5/17/13). 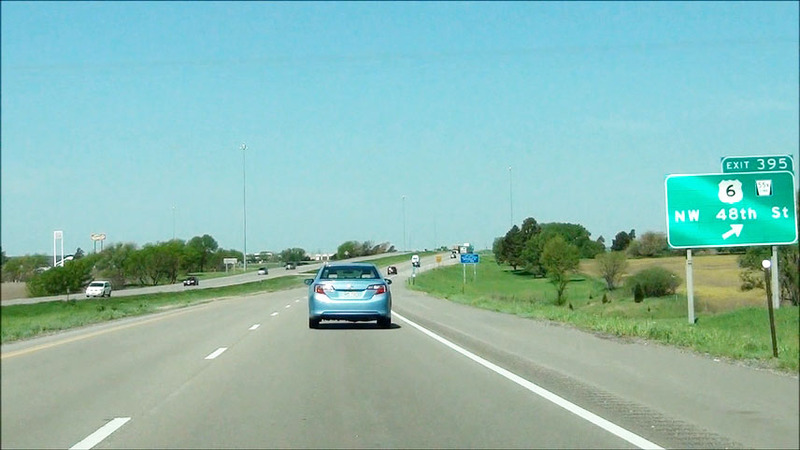 Interstate 80 West at Exit 285: Nebraska Link 10C - Gibbon (Photo taken 5/17/13). 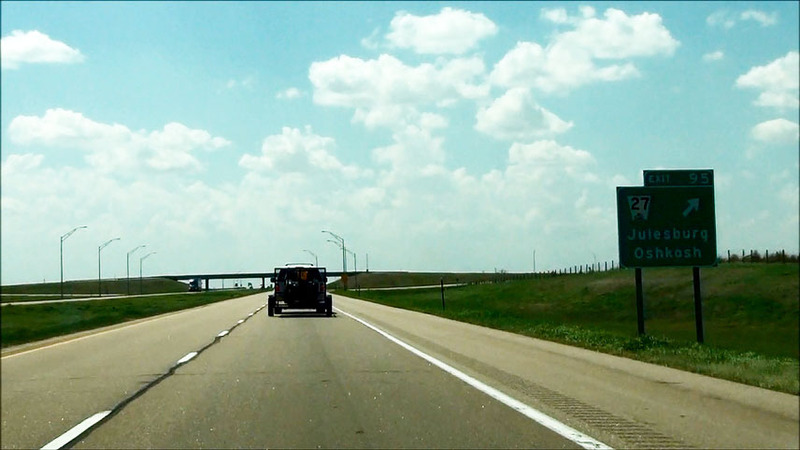 Take Exit 279 to Fort Kearney and Pioneer Village. (Photo taken 5/17/13). 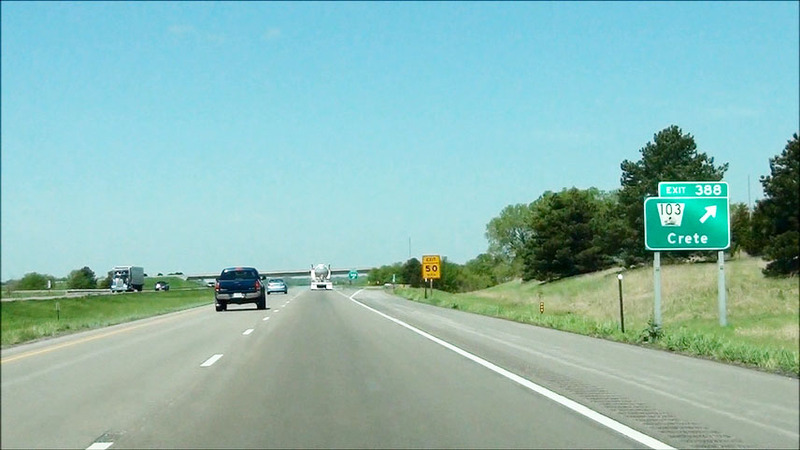 Interstate 80 West at Exit 279: NE 10 - Minden (Photo taken 5/17/13). Mileage sign located near mile marker 279. 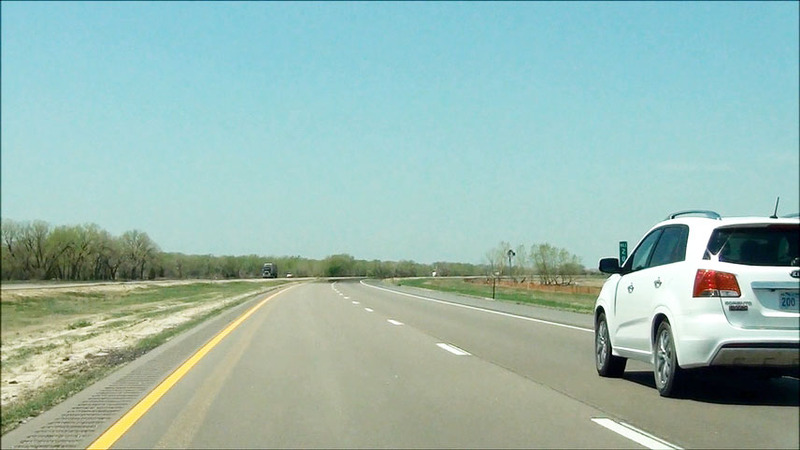 It's 4 miles to the next exit and 107 miles to North Platte. (Photo taken 5/17/13). 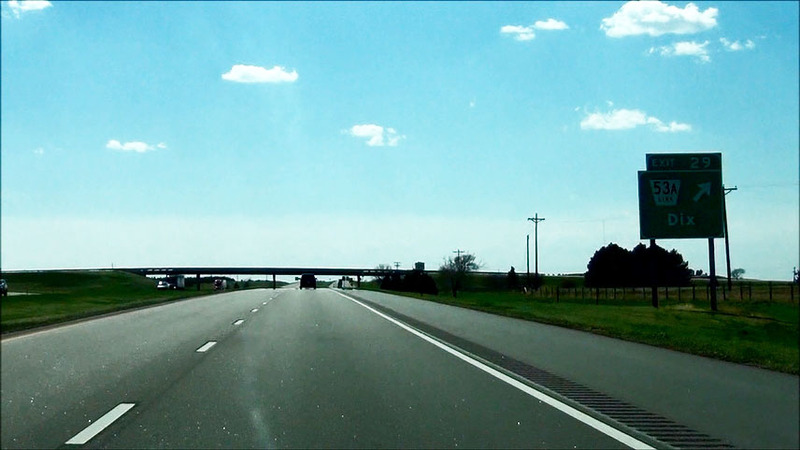 Interstate 80 West: Road view from near mile marker 275.5 as you pass under the Great Platte River Road Archway Monument. (Photo taken 5/17/13). 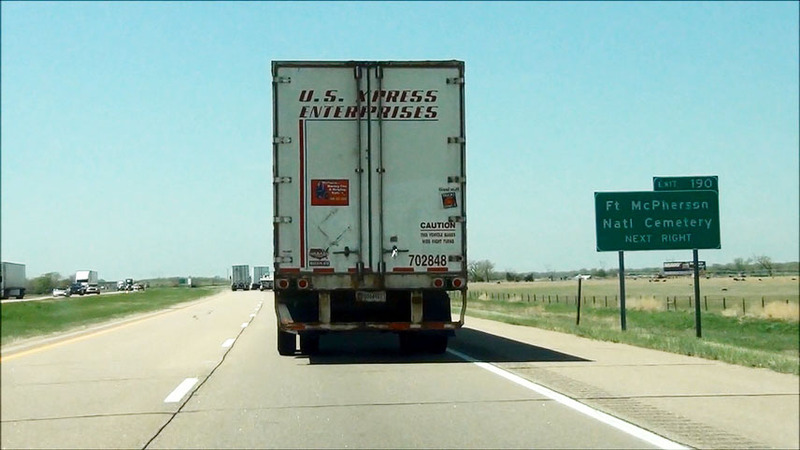 Take Exit 272 to the University of Nebraska at Kearney and Museum of Nebraska Art. (Photo taken 5/17/13). 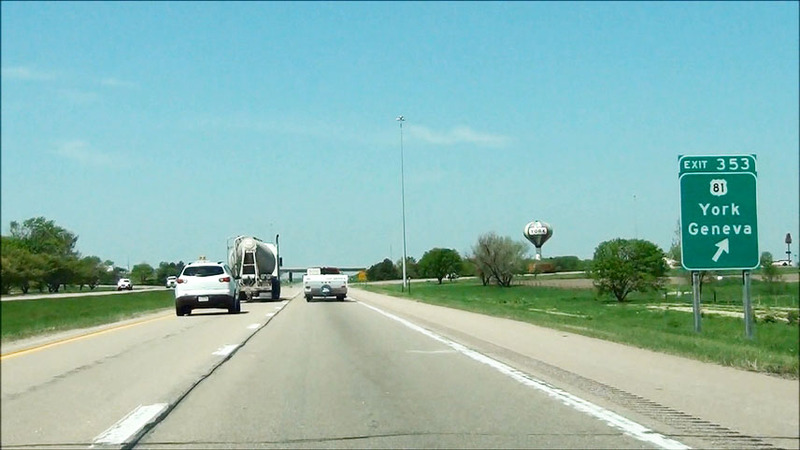 Interstate 80 West at Exit 272: NE 44 - Kearney / Archway Monument (Photo taken 5/17/13). 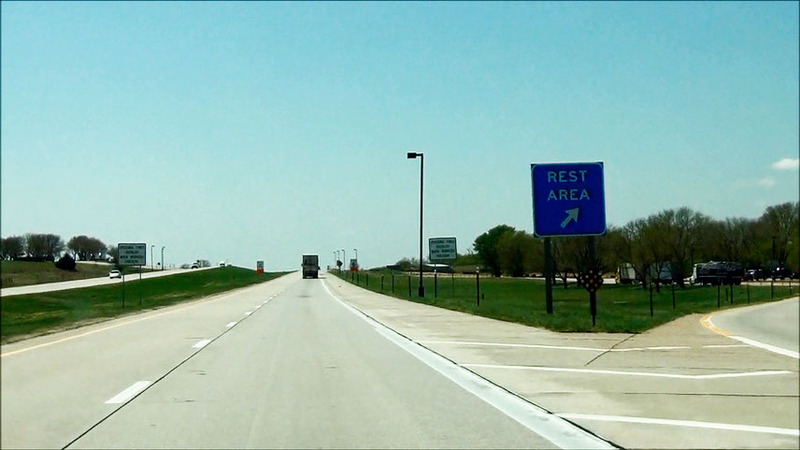 Interstate 80 West at the Rest Area located near mile marker 271. (Photo taken 5/17/13). 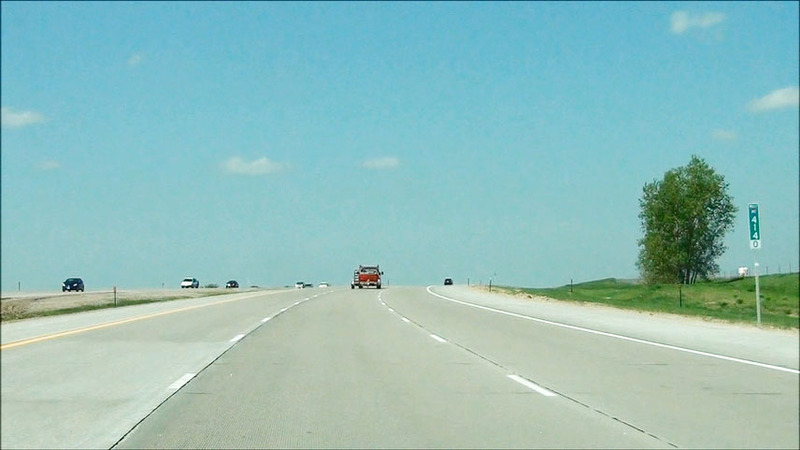 Interstate 80 West: Road view from mile marker 265. (Photo taken 5/17/13). 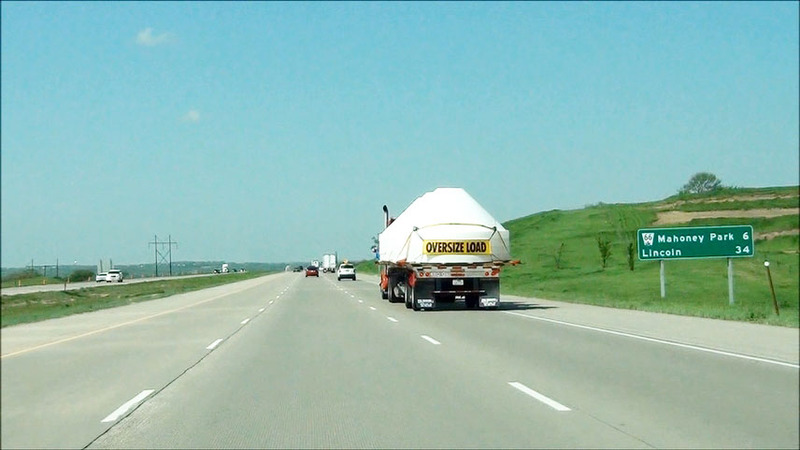 Interstate 80 West at Exit 263: Nebraska Link 10B - Odessa (Photo taken 5/17/13). 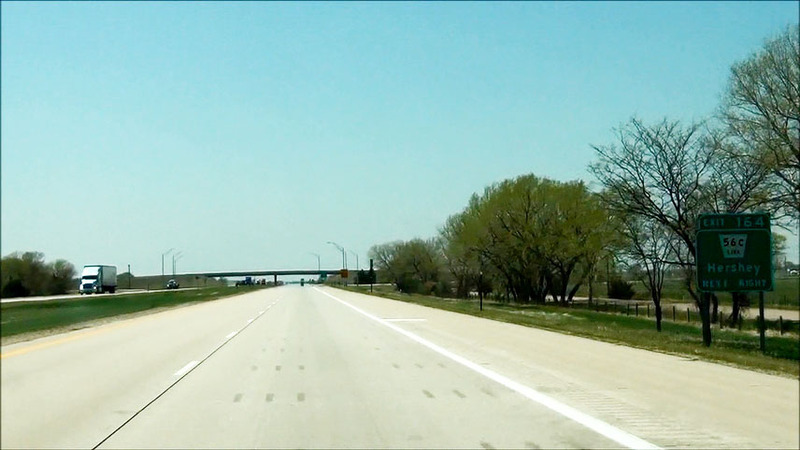 Interstate 80 West at Exit 257: US 183 - Elm Creek / Holdrege (Photo taken 5/17/13). 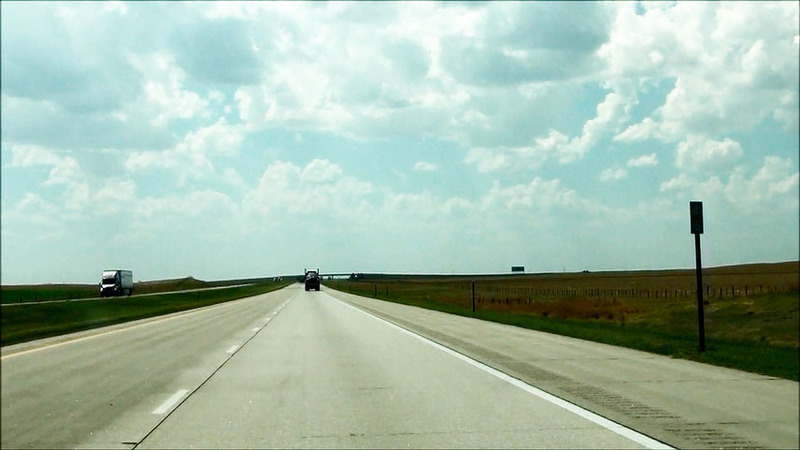 Interstate 80 West: Road view from mile marker 252. (Photo taken 5/17/13). 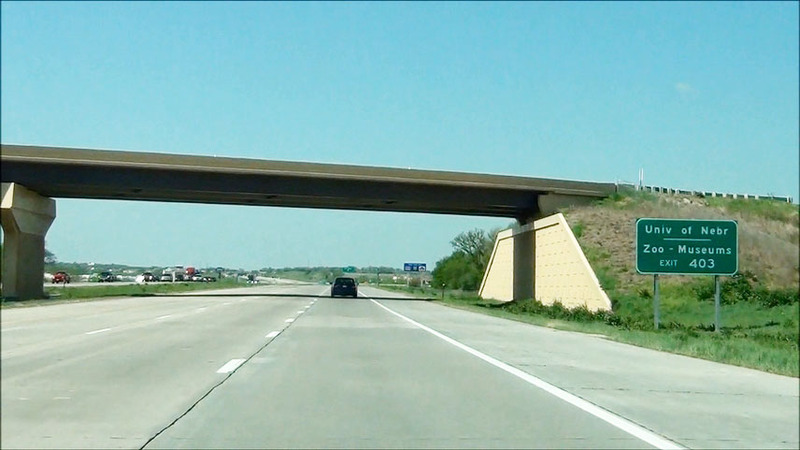 Interstate 80 West at Exit 248: Nebraska Link 24B - Overton (Photo taken 5/17/13). 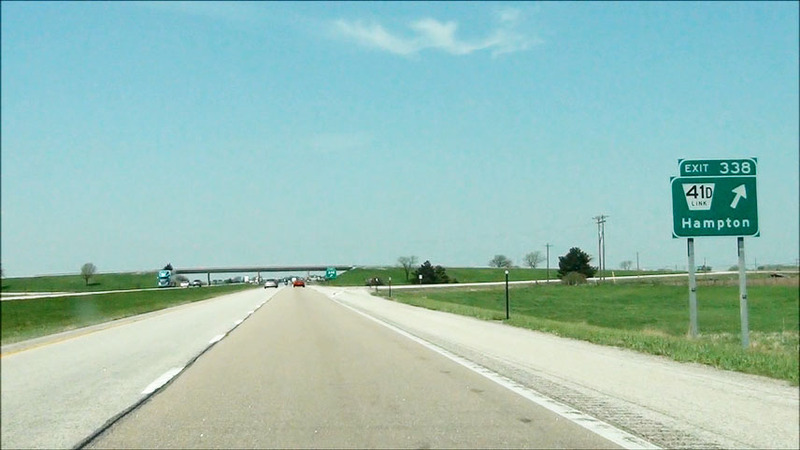 Interstate 80 West: Road view from mile marker 241. (Photo taken 5/17/13). 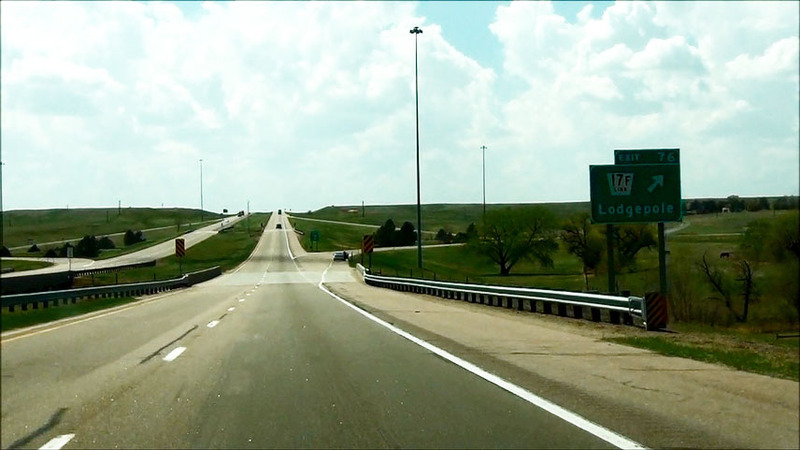 Interstate 80 West at Exit 237: US 283 - Lexington / Arapahoe (Photo taken 5/17/13). 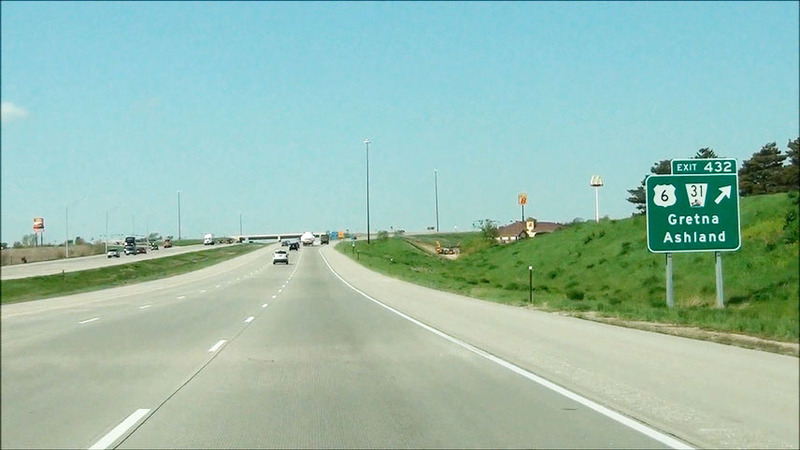 Interstate 80 West at Exit 231: Nebraska Link 24A - Darr Rd (Photo taken 5/17/13). 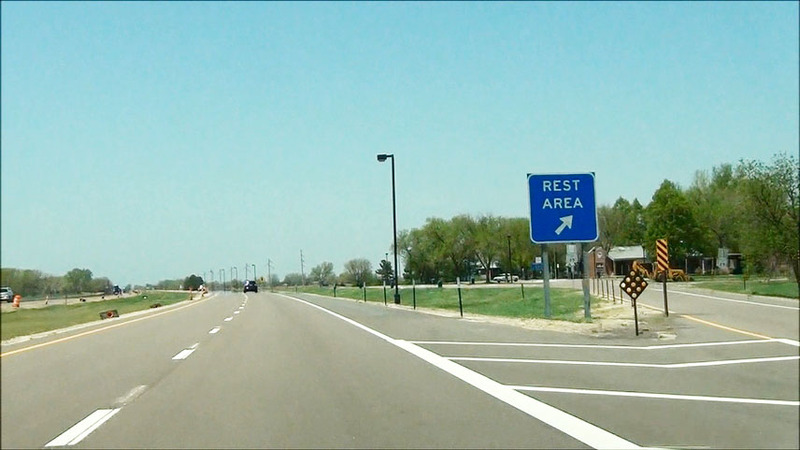 Interstate 80 West at the Rest Area located near mile marker 227. (Photo taken 5/17/13). Take the next exit (Exit 222) to the Robert Henri Museum. (Photo taken 5/17/13). 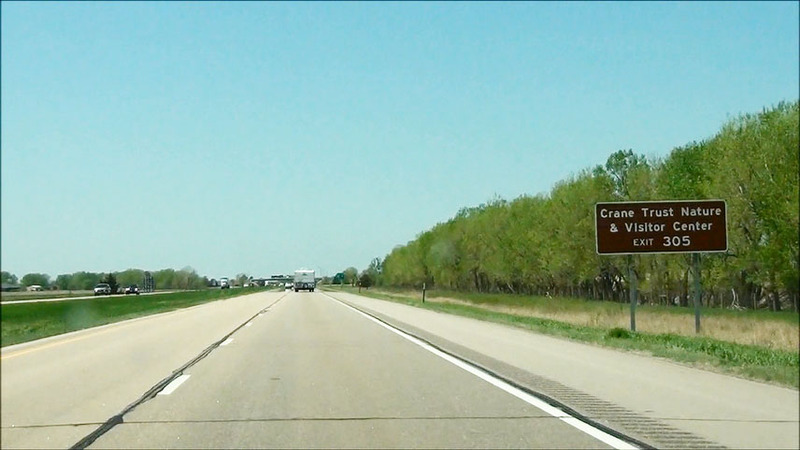 Interstate 80 West at Exit 222: NE 21 - Cozad (Photo taken 5/17/13). 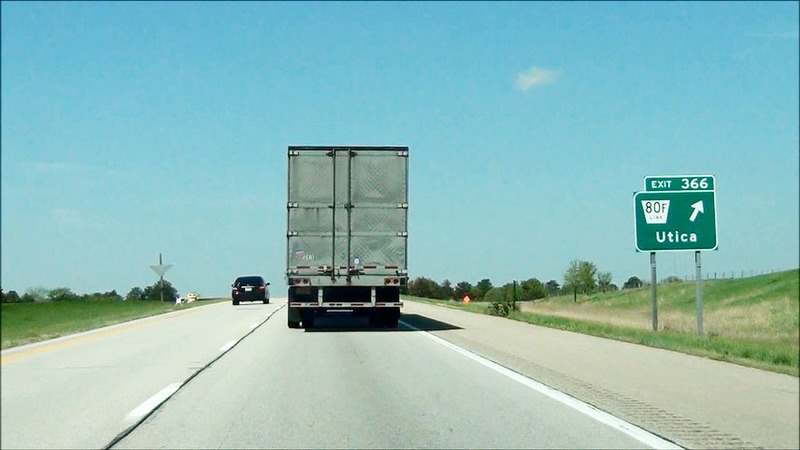 Interstate 80 West: Road view from mile marker 217. (Photo taken 5/17/13). Take Exit 211 to Farnam. (Photo taken 5/17/13). 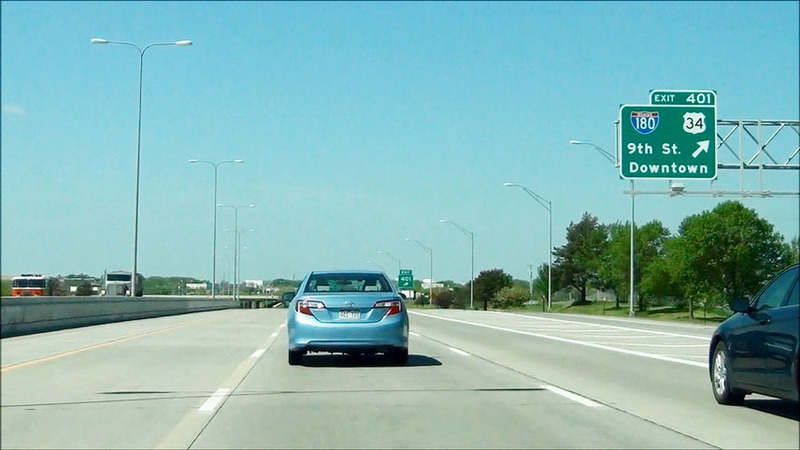 Interstate 80 West at Exit 211: NE 47 - Gothenburg (Photo taken 5/17/13). 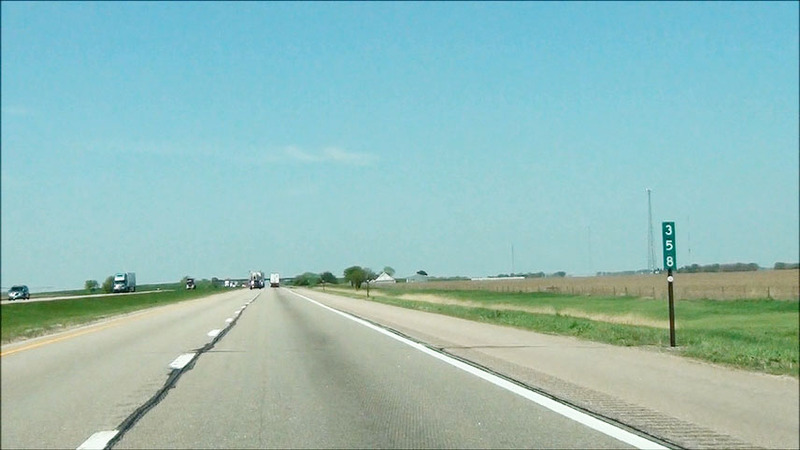 Interstate 80 West: Road view from mile marker 205. (Photo taken 5/17/13). 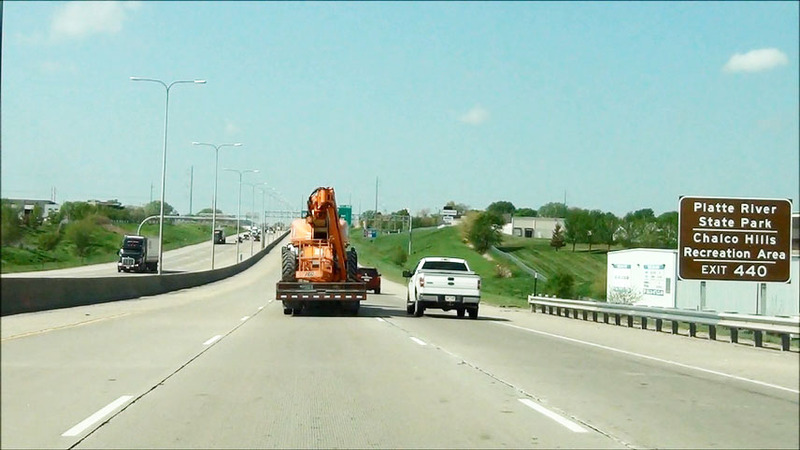 Interstate 80 West at Exit 199: Nebraska Link 56D - Brady (Photo taken 5/17/13). 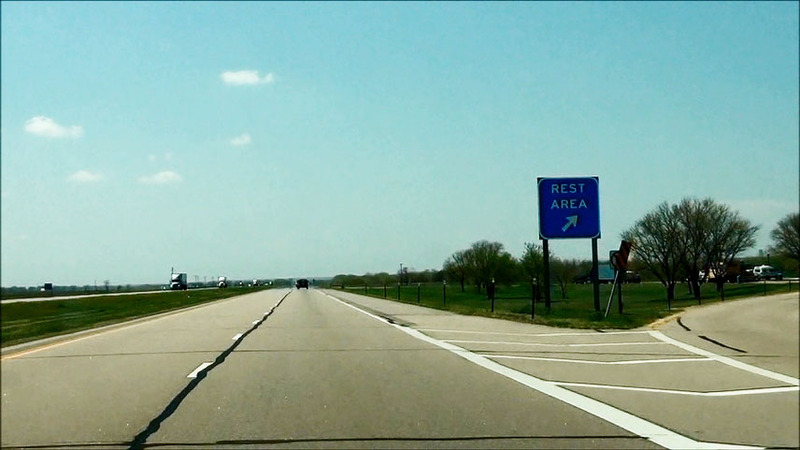 Interstate 80 West at the Rest Area located near mile marker 194. (Photo taken 5/17/13). Take Exit 190 to Ft McPherson National Cemetery. (Photo taken 5/17/13). 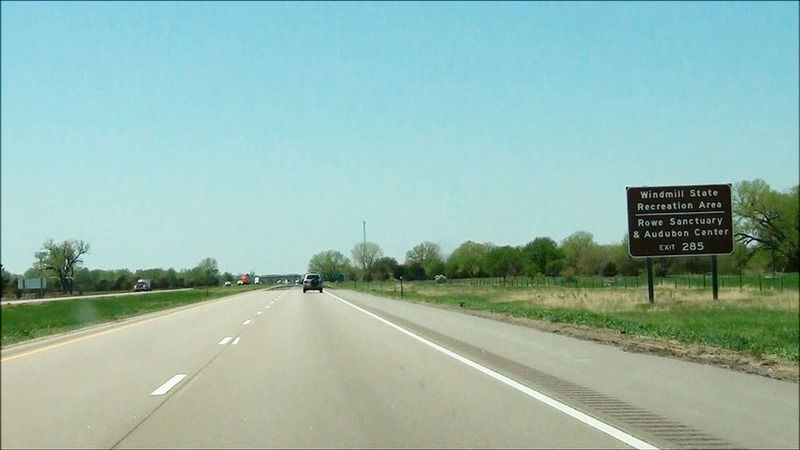 Interstate 80 West at Exit 190: Nebraska Spur 56A - Maxwell (Photo taken 5/17/13). 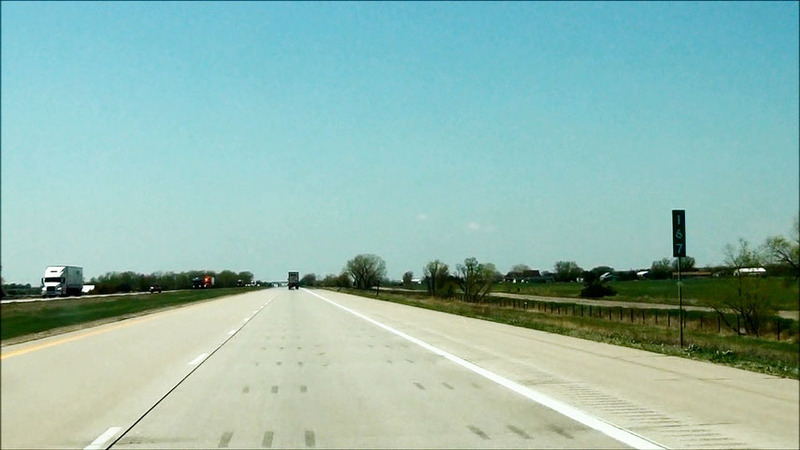 Interstate 80 West: Road view from mile marker 185. (Photo taken 5/17/13). 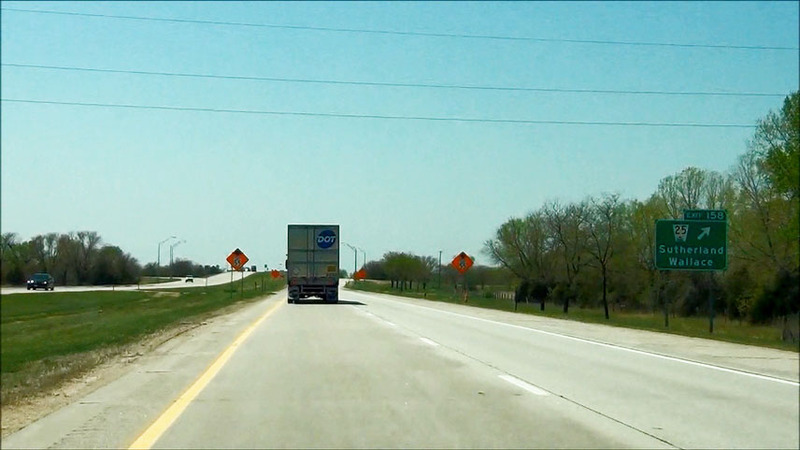 Interstate 80 West at the Weigh Station located at mile marker 181. (Photo taken 5/17/13). Take Exit 179 to the Regional Airport and Industrial Park. (Photo taken 5/17/13). 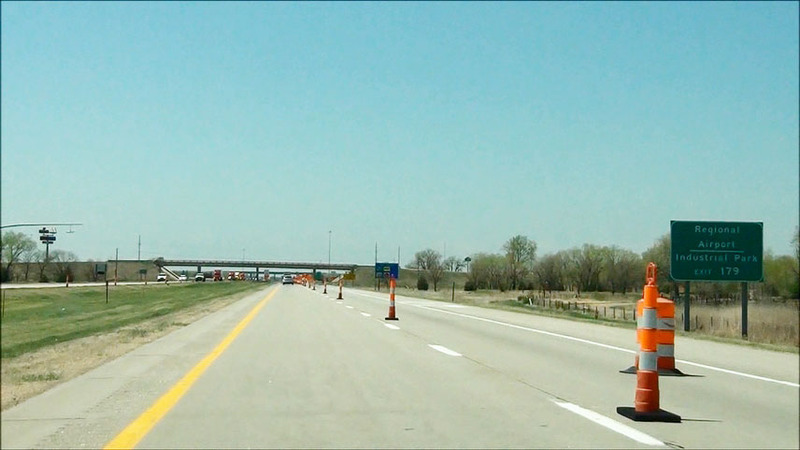 Interstate 80 West at Exit 179: Nebraska Link 56G / To US 30 - North Platte East Entrance (Photo taken 5/17/13). Interstate 80 West approaching Exit 177 - 1 mile. (Photo taken 5/17/13). Take Exit 177 to Buffalo Bill Ranch. (Photo taken 5/17/13). 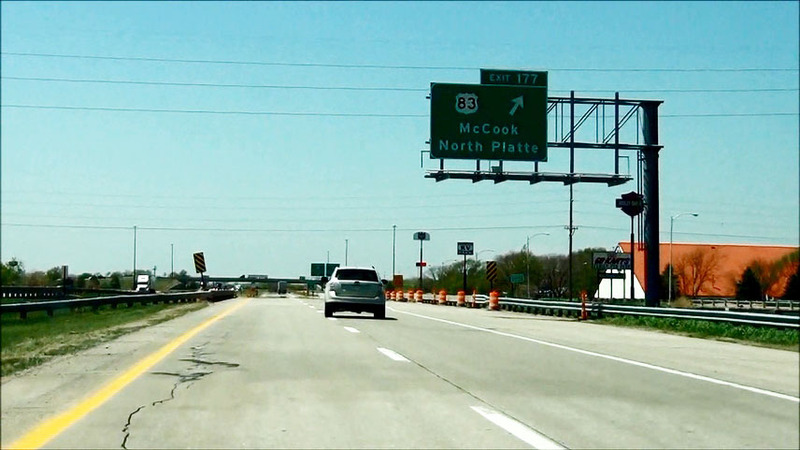 Interstate 80 West at Exit 177: US 83 - McCook / North Platte (Photo taken 5/17/13). 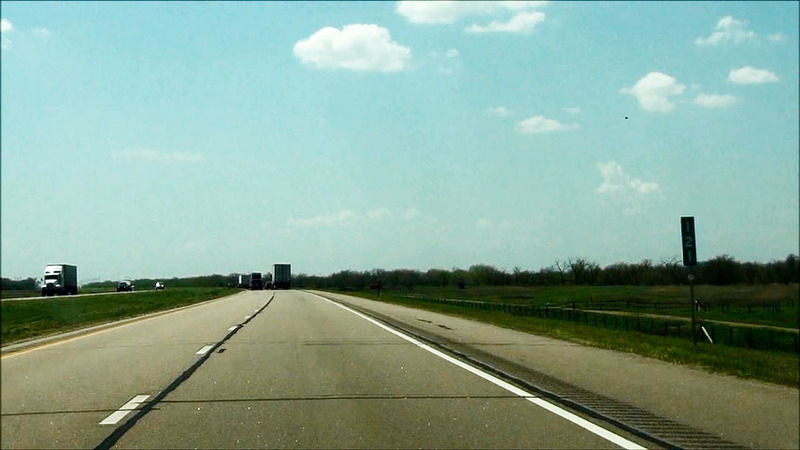 Interstate 80 West: Road view from mile marker 171. (Photo taken 5/17/13). 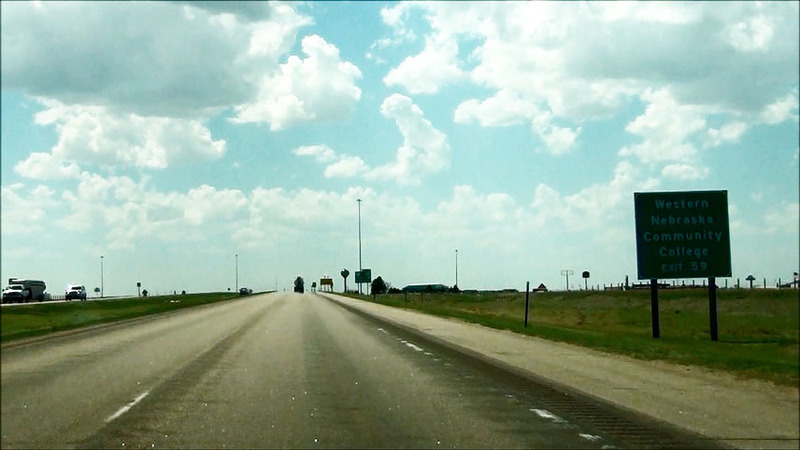 Interstate 80 West: Road view from mile marker 167. (Photo taken 5/17/13). 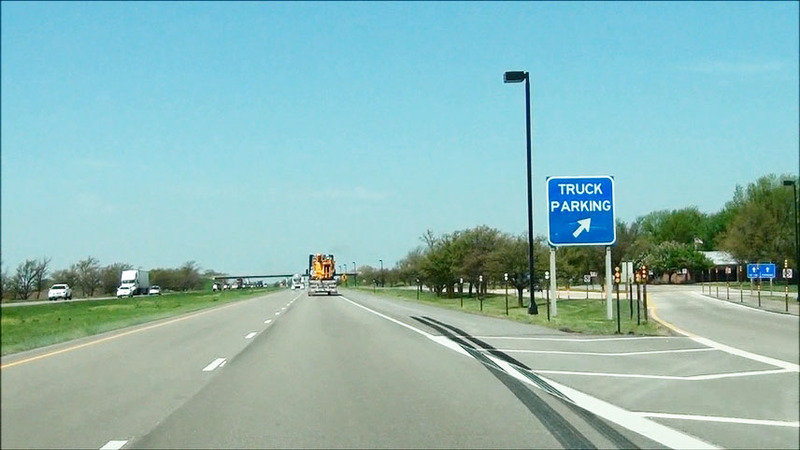 Interstate 80 West at Exit 164: Nebraska Link 56C - Hershey (Photo taken 5/17/13). 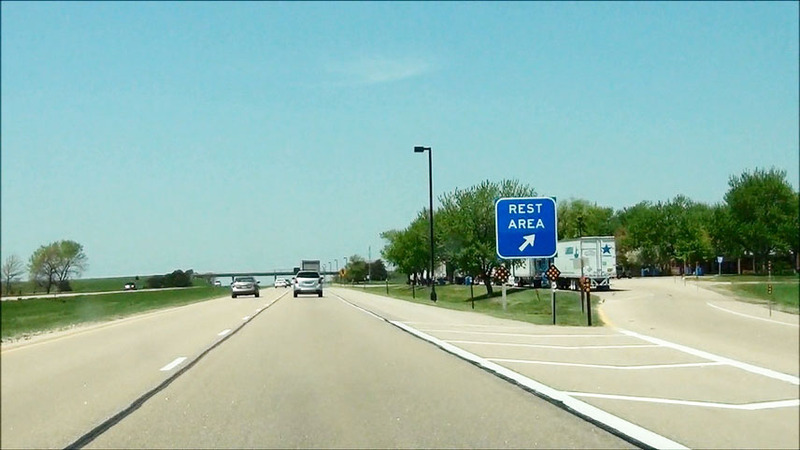 Interstate 80 West at the Rest Area located near mile marker 160. (Photo taken 5/17/13). Take Exit 158 to Sutherland Reservoir. (Photo taken 5/17/13). 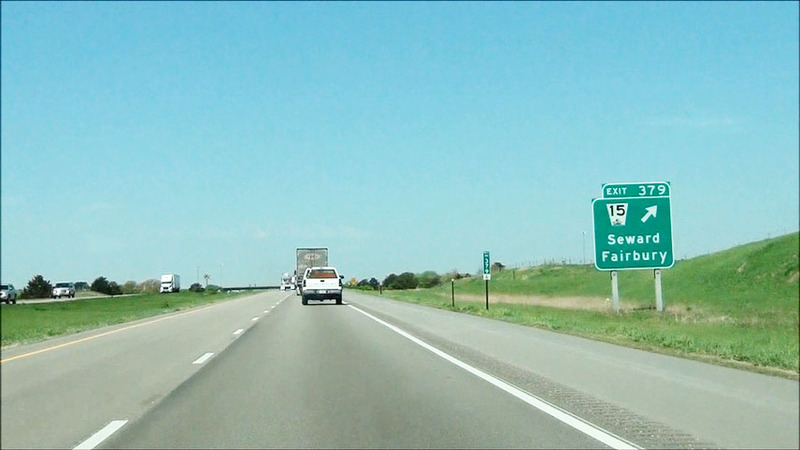 Interstate 80 West at Exit 158: NE 25 - Sutherland / Wallace (Photo taken 5/17/13). 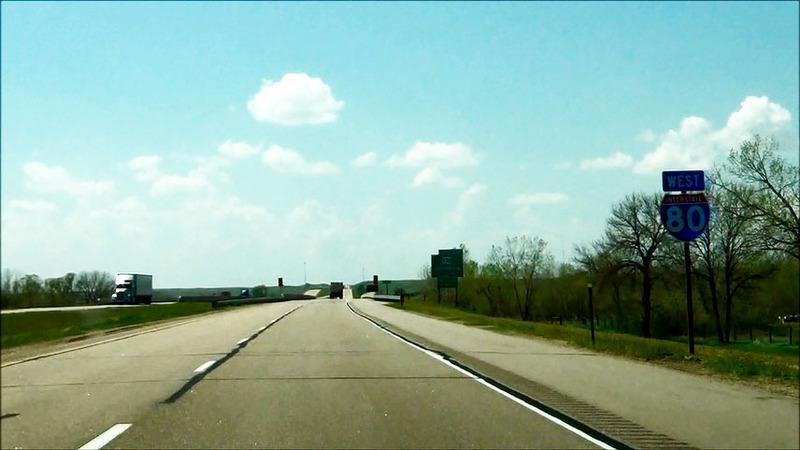 Interstate 80 West: Road view from mile marker 151. (Photo taken 5/17/13). 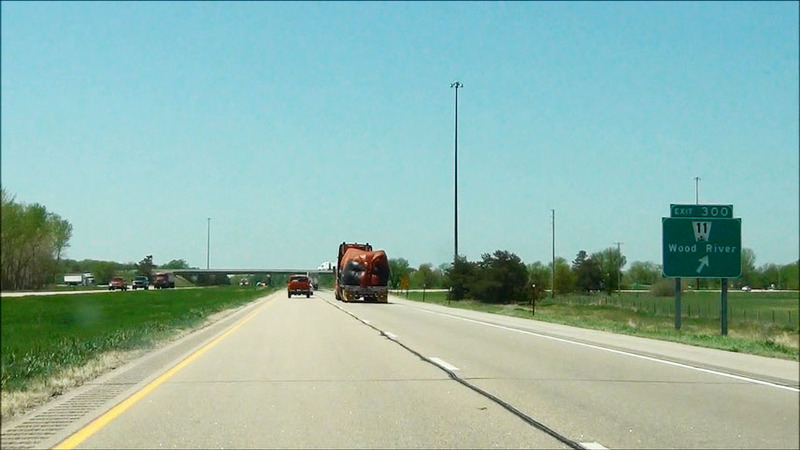 Interstate 80 West at Exit 145: Nebraska Link 51C - Paxton (Photo taken 5/17/13). 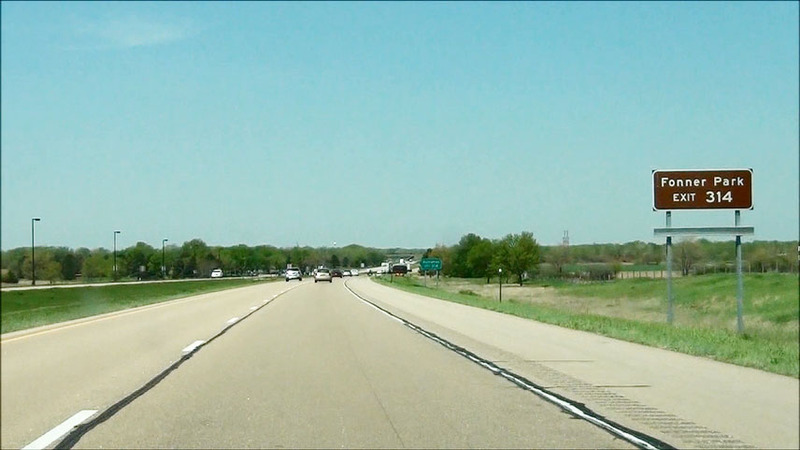 Interstate 80 West: Road view from mile marker 139. (Photo taken 5/17/13). 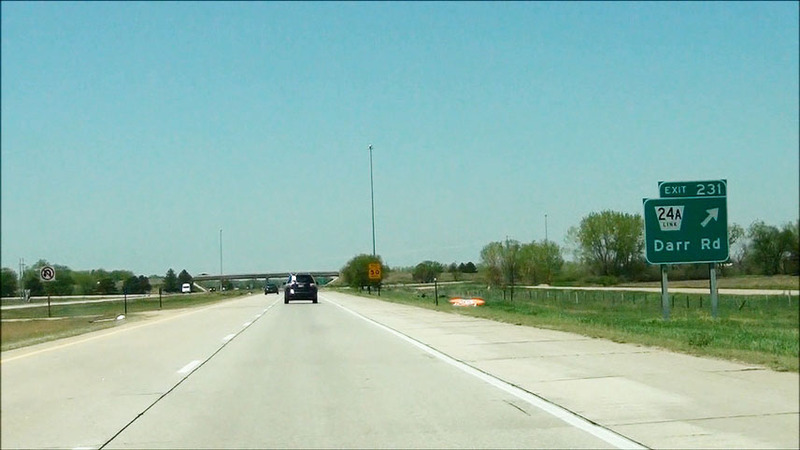 Interstate 80 West at Exit 133: Nebraska Link 51B - Roscoe (Photo taken 5/17/13). 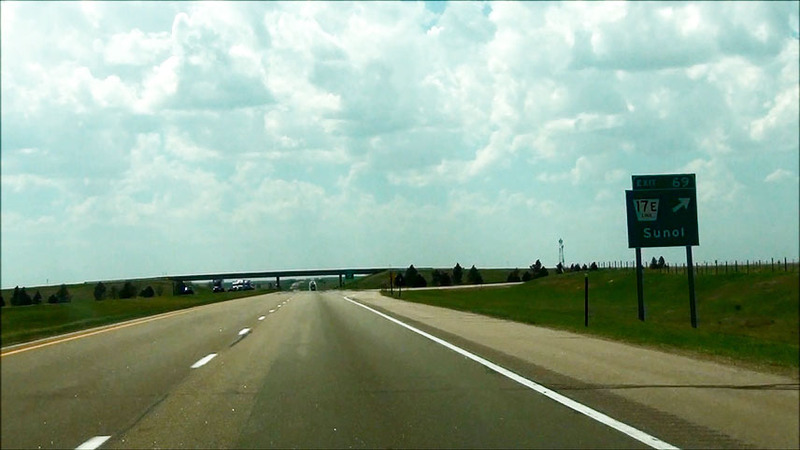 Interstate 80 West at the Rest Area located near mile marker 132. (Photo taken 5/17/13). 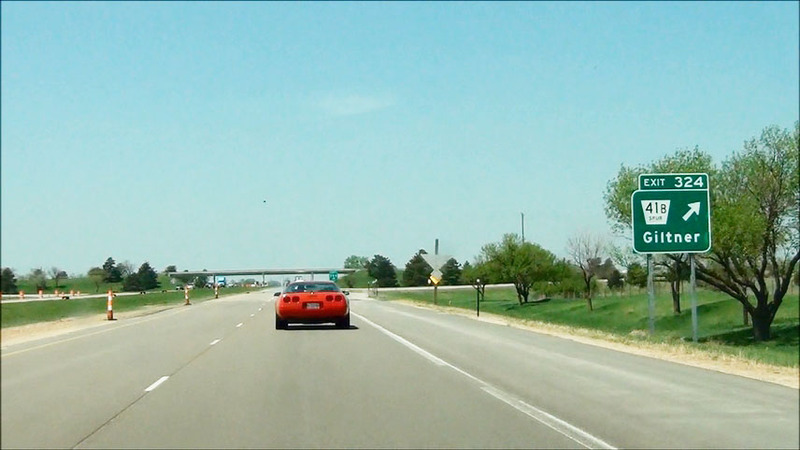 Take Exit 126 to Lake McConaughy Visitor & Water Interpretive Center. (Photo taken 5/17/13). 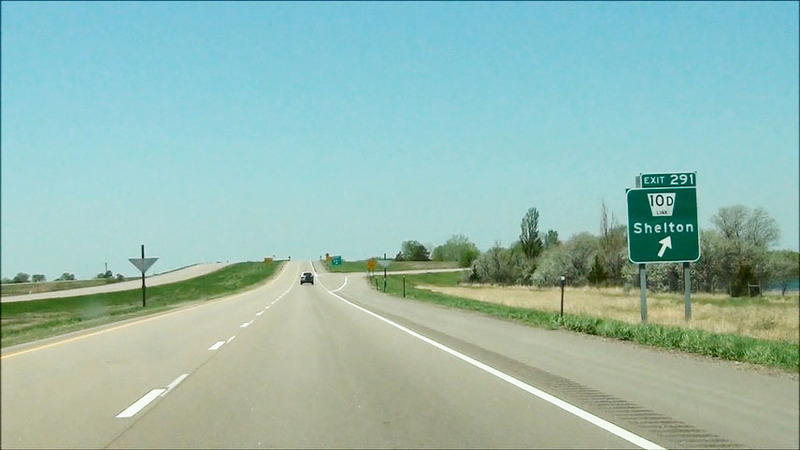 Interstate 80 West at Exit 126: US 26 / NE 61 - Grant / Ogallala (Photo taken 5/17/13). 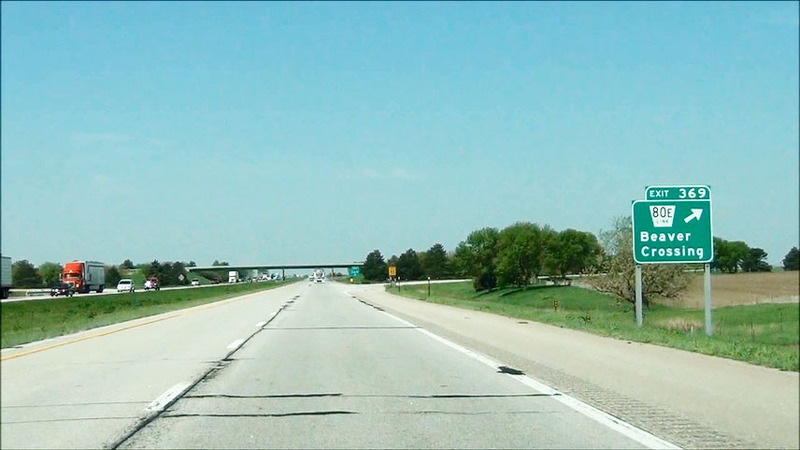 Interstate 80 West: Road view from mile marker 121. (Photo taken 5/17/13). 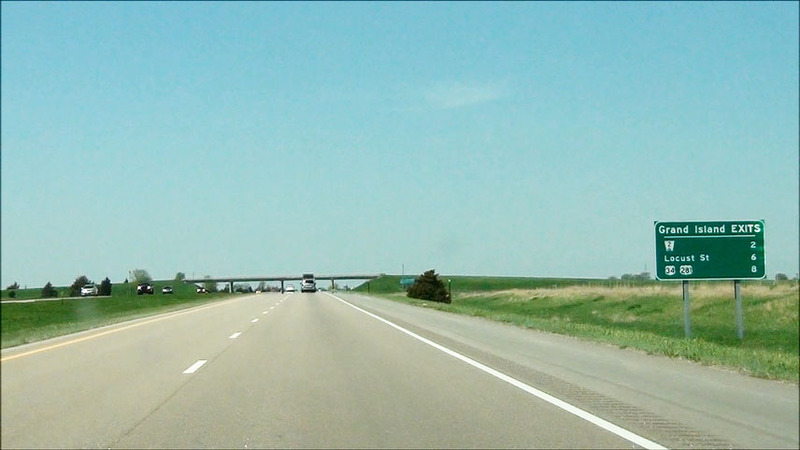 Interstate 80 West at Exit 117: Nebraska Link 51A - Brule (Photo taken 5/17/13). 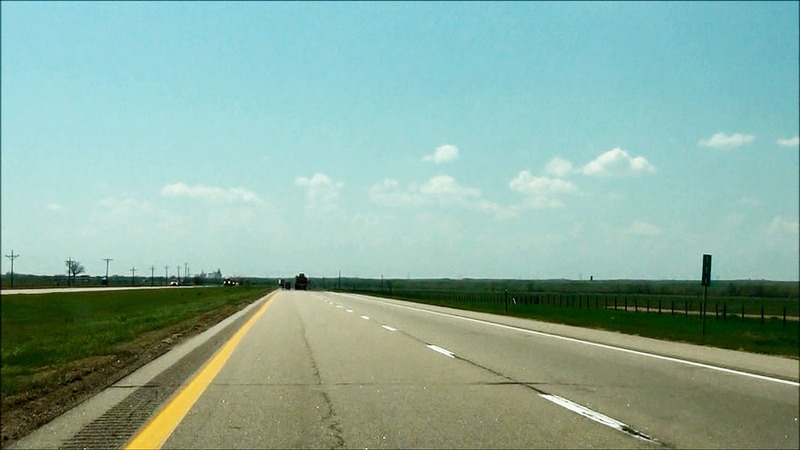 Interstate 80 West: Road view from mile marker 111. (Photo taken 5/17/13). 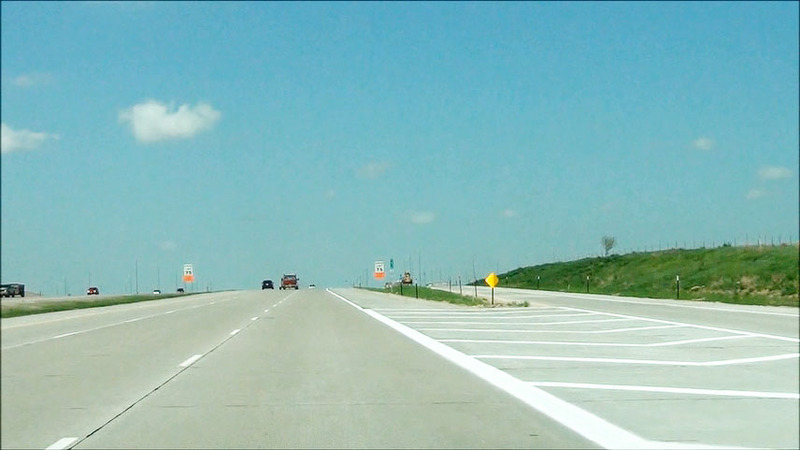 Interstate 80 West at Exit 107: Nebraska Link 25B - Big Springs (Photo taken 5/17/13). Mileage sign located near mile marker 104. 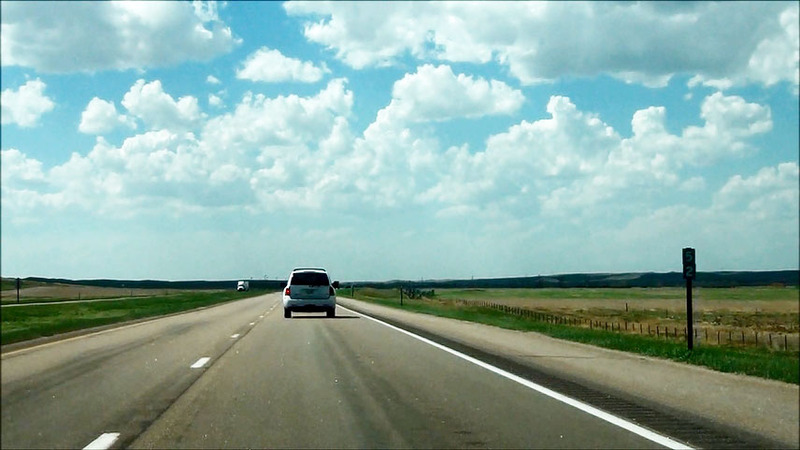 It's 148 miles to Cheyenne and 169 miles to Denver. (Photo taken 5/17/13). Interstate 80 West approaching Exit 102 - 1 mile. (Photo taken 5/17/13). 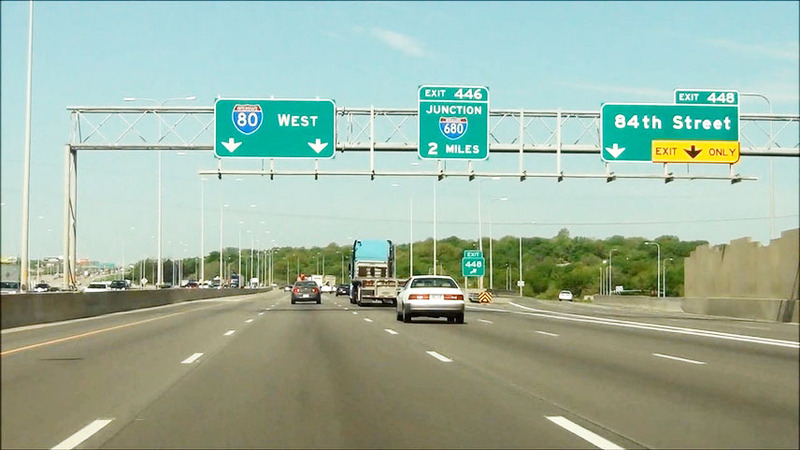 As you approach the junction of Interstate 76, Interstate 80 goes to 3 lanes. 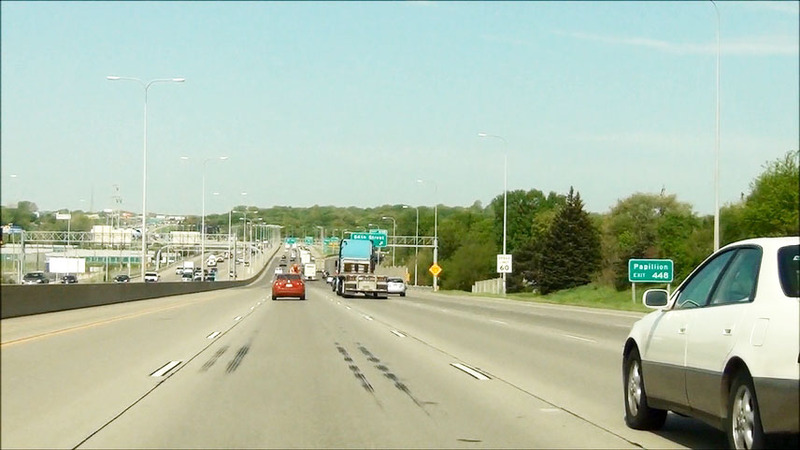 To continue on I-80 West you will need to be in either the right or center lanes. (Photo taken 5/17/13). 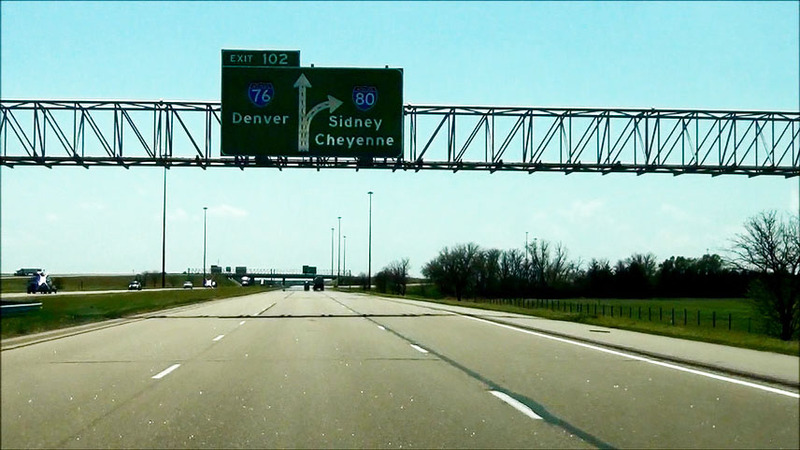 Interstate 80 West at Exit 102: Interstate 76 West - Denver (Photo taken 5/17/13). 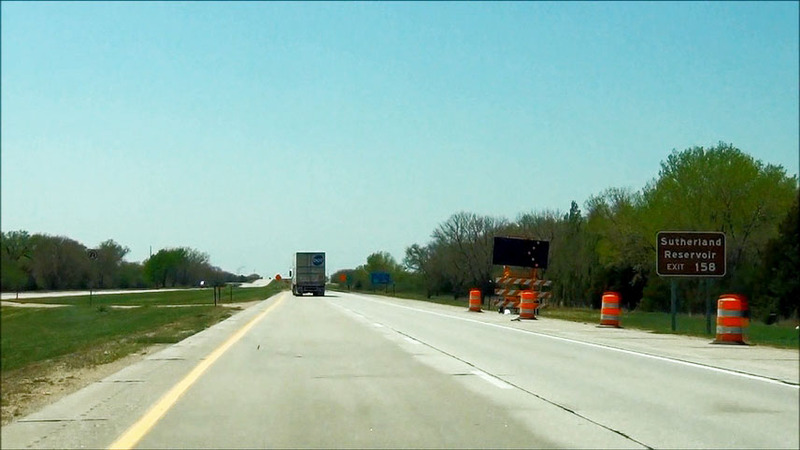 Interstate 80 West assurance shield located near mile marker 102. (Photo taken 5/17/13). 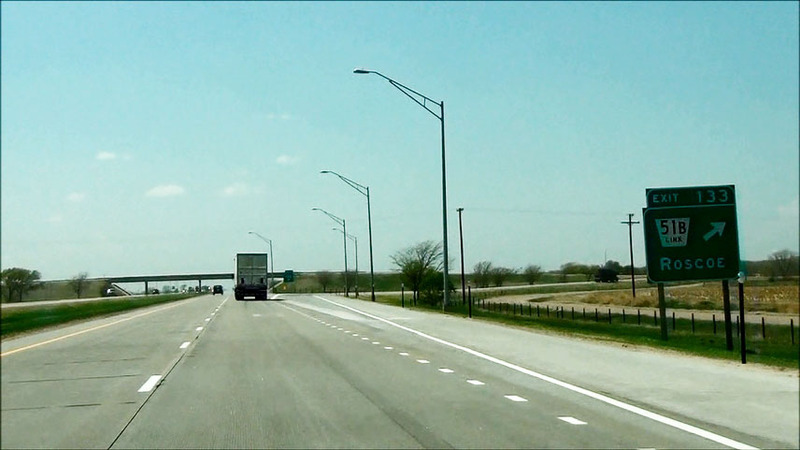 Interstate 80 West at Exit 101: US 138 - Big Springs / Julesburg (Photo taken 5/17/13). 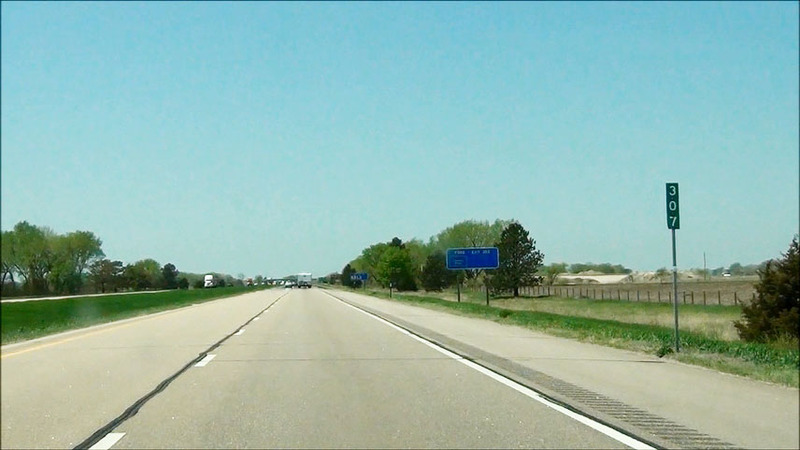 Interstate 80 West at Exit 95: NE 27 - Julesburg / Oshkosh (Photo taken 5/17/13). 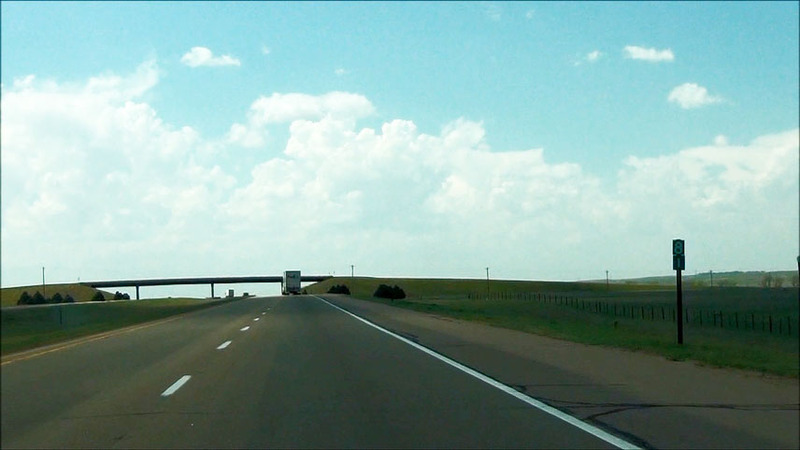 Interstate 80 West: Road view from mile marker 91. I'm sorry for the contrast of these recent pictures. 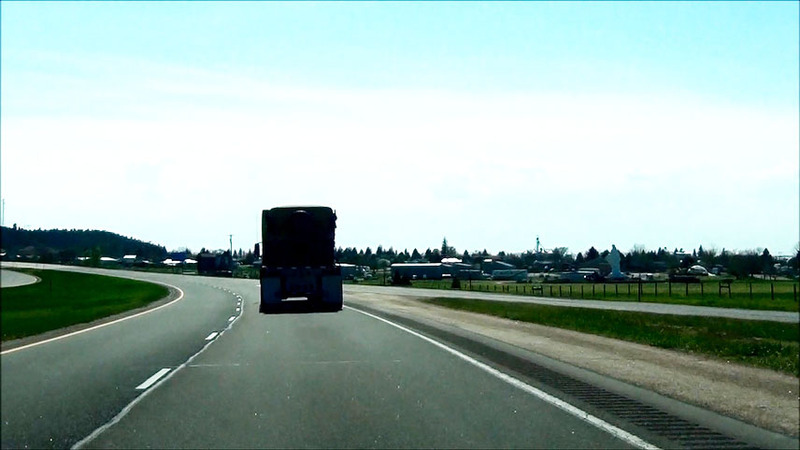 The sun was in just the right position to make road photography difficult at the time. (Photo taken 5/17/13). 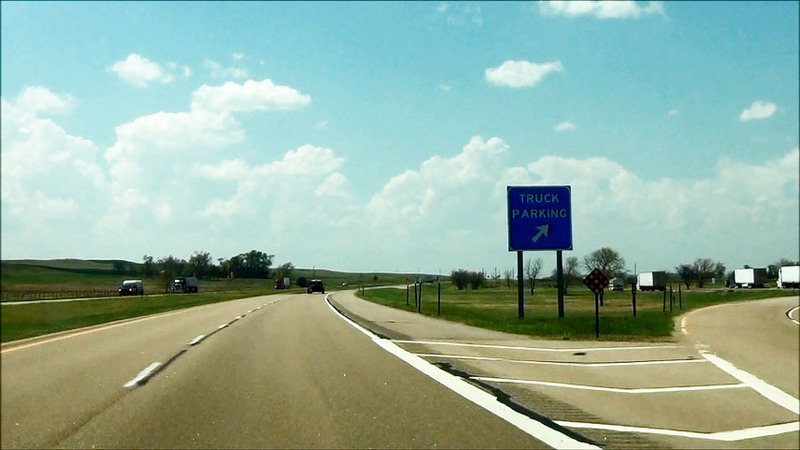 Interstate 80 West at the Truck Parking Area located at mile marker 88. (Photo taken 5/17/13). 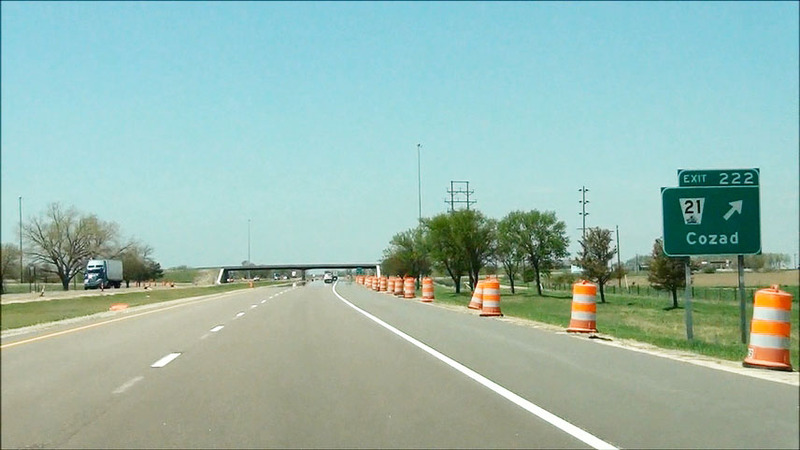 Interstate 80 West at Exit 85: Nebraska Link 25A - Chappell (Photo taken 5/17/13). 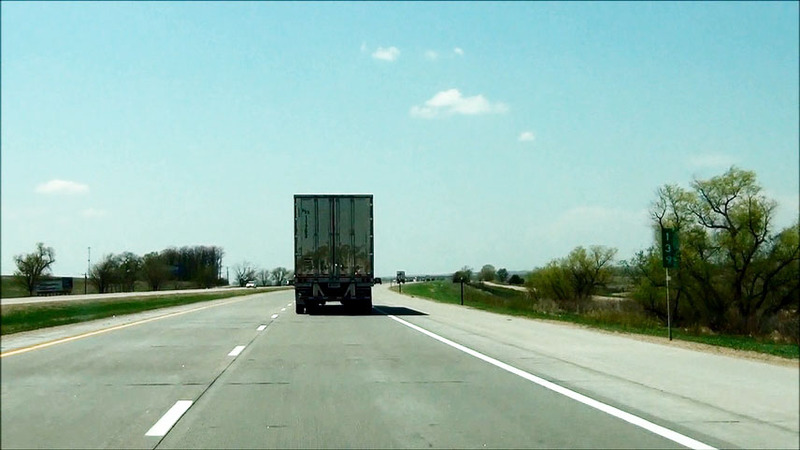 Interstate 80 West: Road view from mile marker 81. (Photo taken 5/17/13). 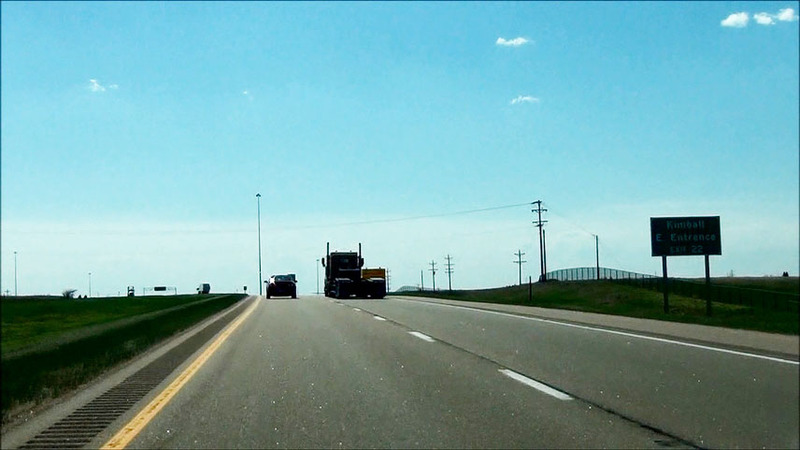 Interstate 80 West at Exit 76: Nebraska Link 17F - Lodgepole (Photo taken 5/17/13). 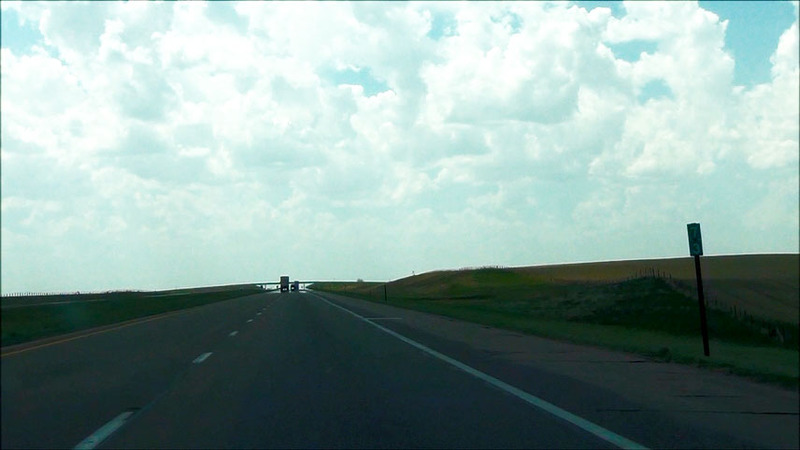 Interstate 80 West: Road view from mile marker 73. (Photo taken 5/17/13). 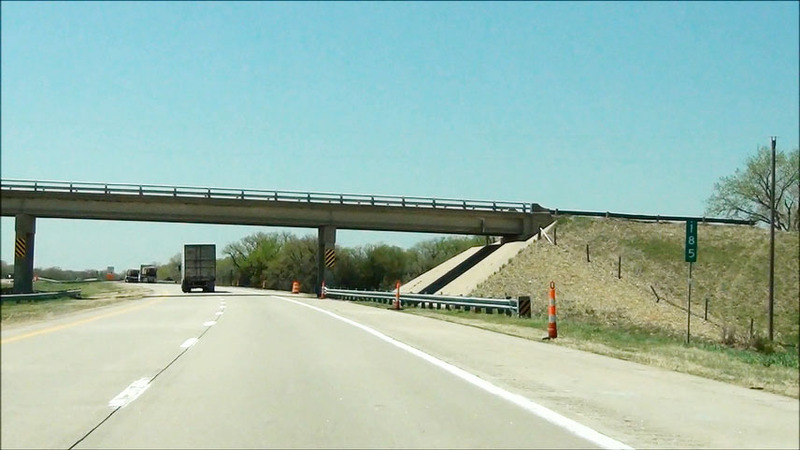 Interstate 80 West at Exit 69: Nebraska Link 17E - Sunol (Photo taken 5/17/13). 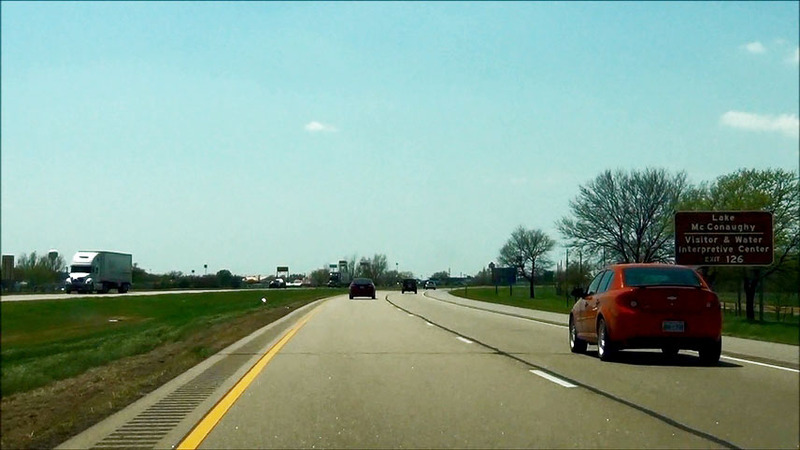 Interstate 80 West: Road view from mile marker 65. (Photo taken 5/17/13). 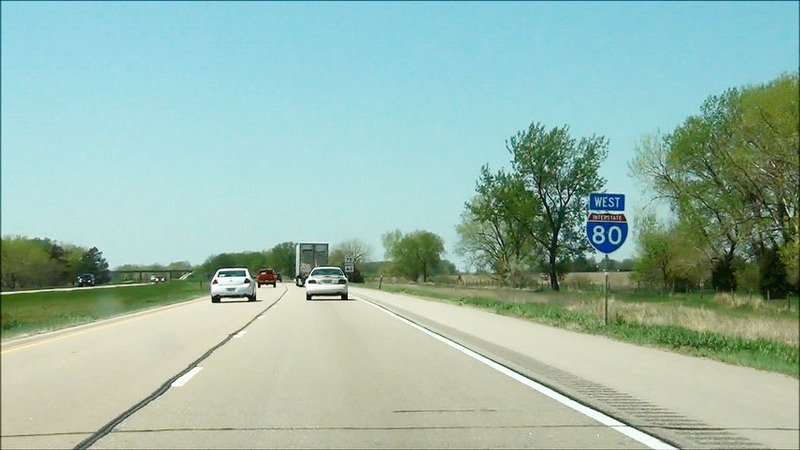 Interstate 80 West at the Rest Area located near mile marker 61. (Photo taken 5/17/13). 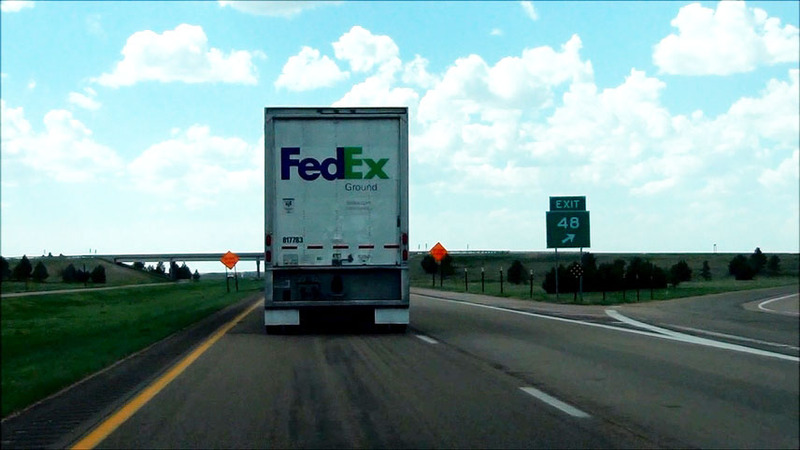 Take Exit 59 to Western Nebraska Community College. (Photo taken 5/17/13). 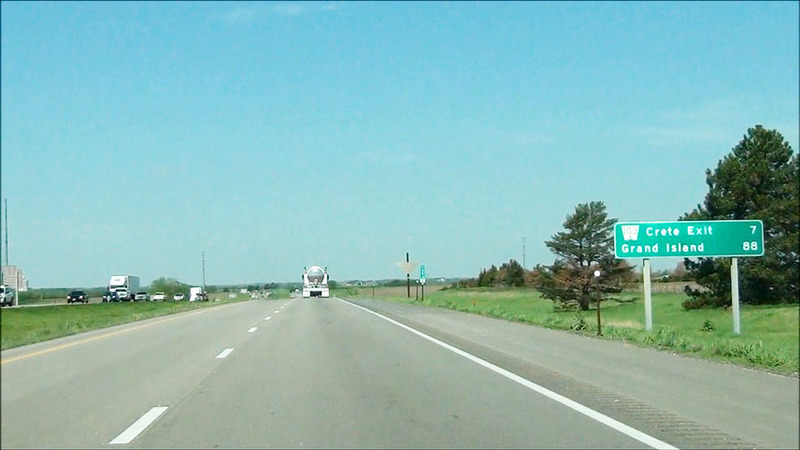 Interstate 80 West at Exit 59: Nebraska Link 17J / US 385 - Sidney / Bridgeport (Photo taken 5/17/13). 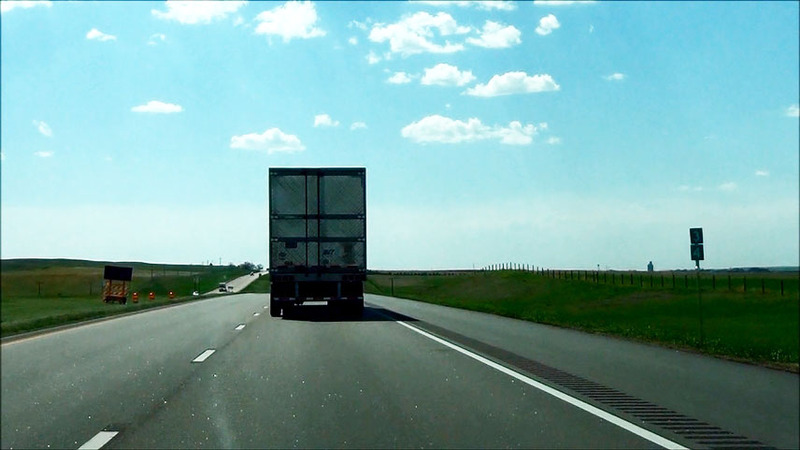 Interstate 80 West: Road view from near mile marker 56. (Photo taken 5/17/13). 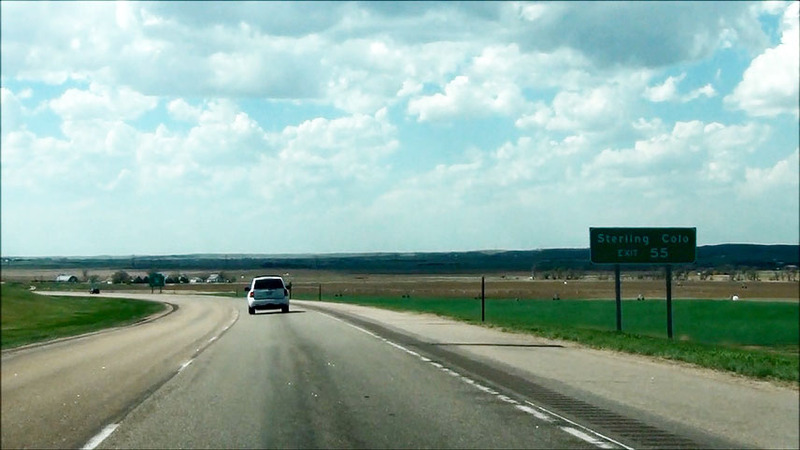 Take Exit 55 to Sterling, CO. (Photo taken 5/17/13). 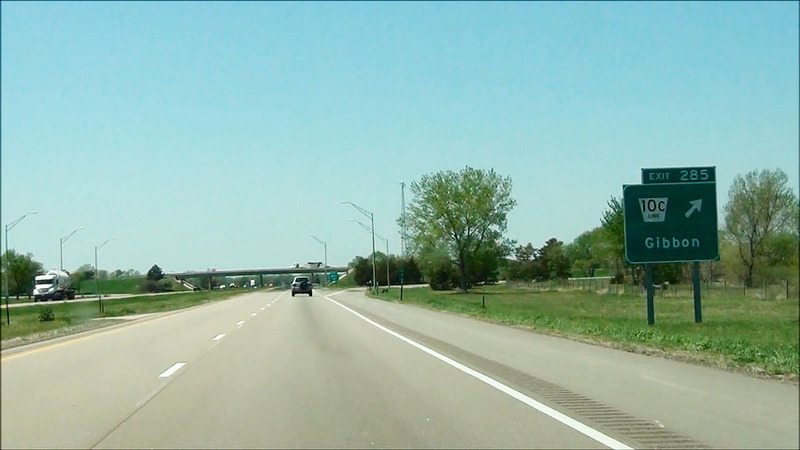 Interstate 80 West at Exit 55: NE 19 - Sidney (Photo taken 5/17/13). 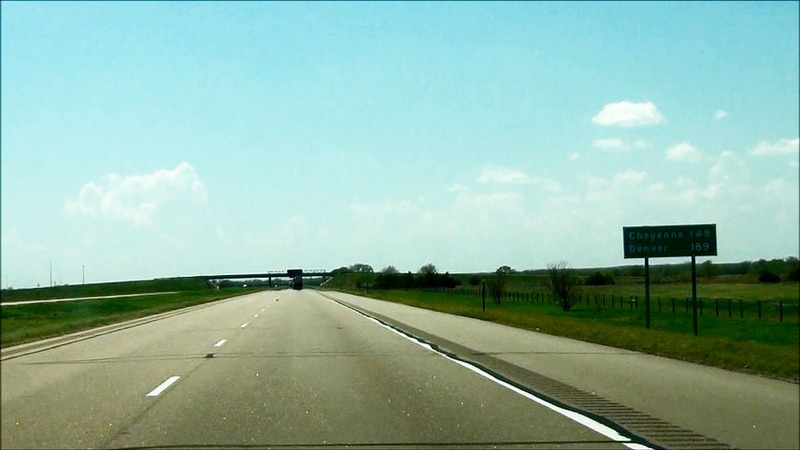 Interstate 80 West: Road view from mile marker 52. (Photo taken 5/17/13). 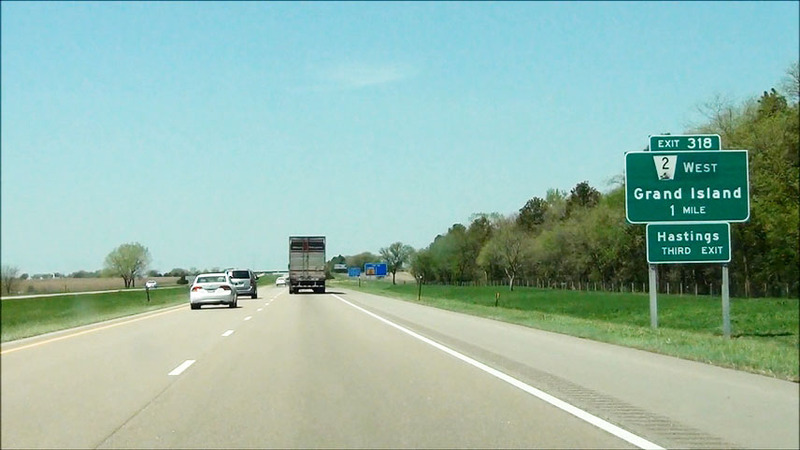 Interstate 80 West at Exit 48: Nebraska Link 17C (Photo taken 5/17/13). 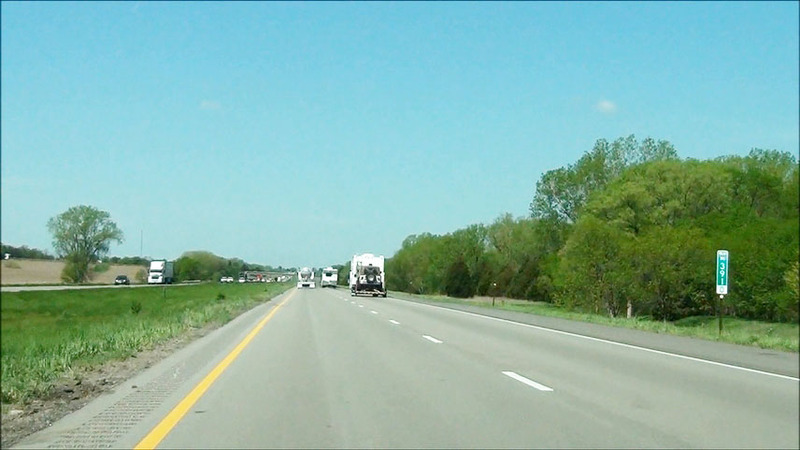 Interstate 80 West at Exit 38: Nebraska Link 17B - Potter (Photo taken 5/17/13). 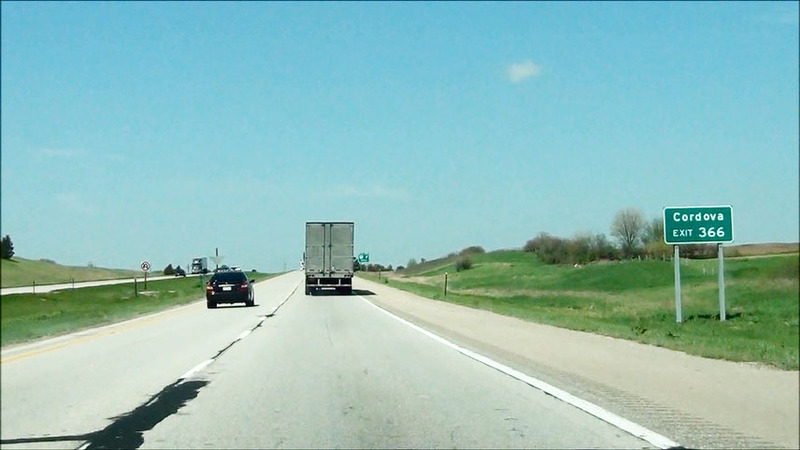 Interstate 80 West: Road view from mile marker 34. (Photo taken 5/17/13). 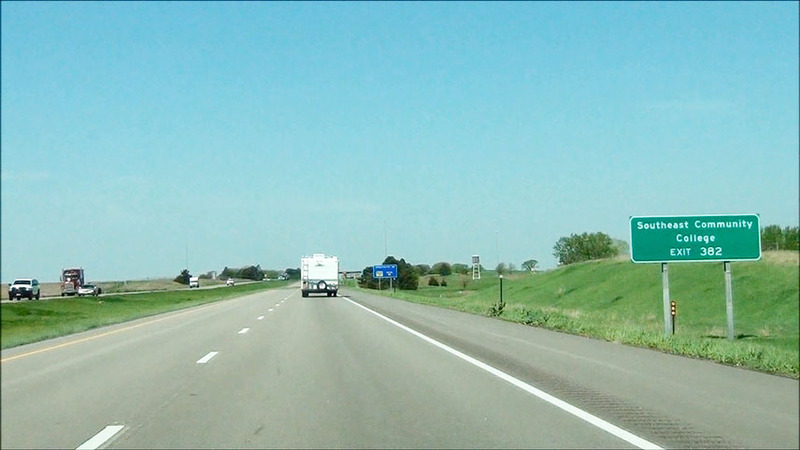 Interstate 80 West at Exit 29: Nebraska Link 53A - Dix (Photo taken 5/17/13). 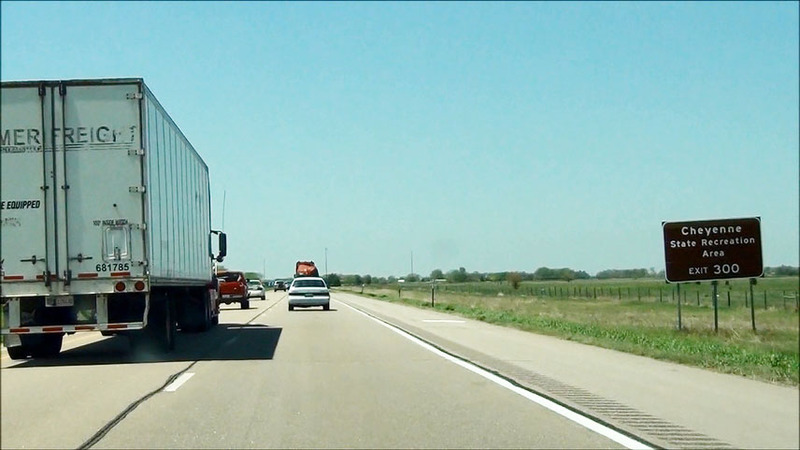 Interstate 80 West at the Truck Parking Area located at mile marker 25. (Photo taken 5/17/13). Take Exit 22 to the East Entrance to Kimball. (Photo taken 5/17/13). 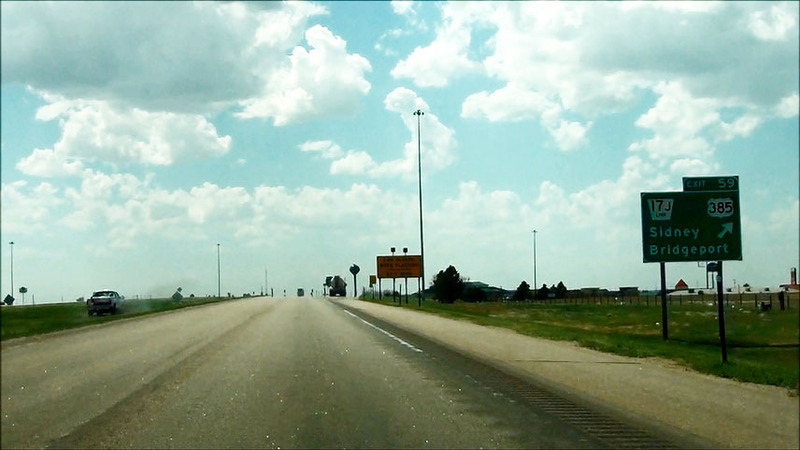 Interstate 80 West at Exit 22: NE 71 North - Gering / Scottsbluff (Photo taken 5/17/13). 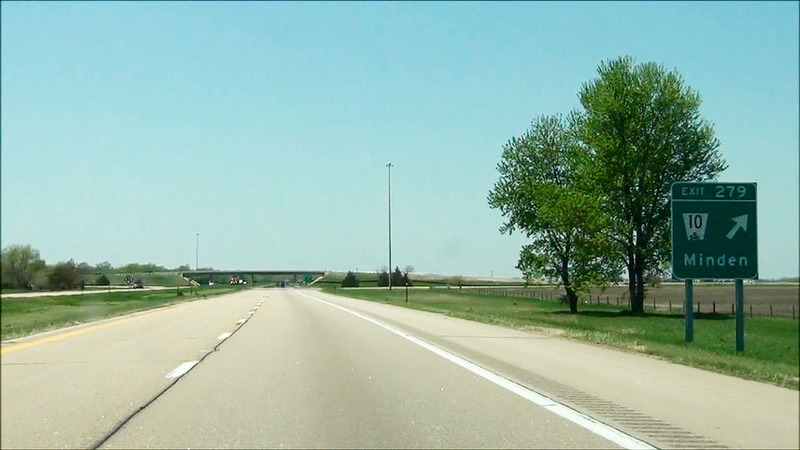 Interstate 80 West at Exit 20: NE 71 South - Kimball (Photo taken 5/17/13). 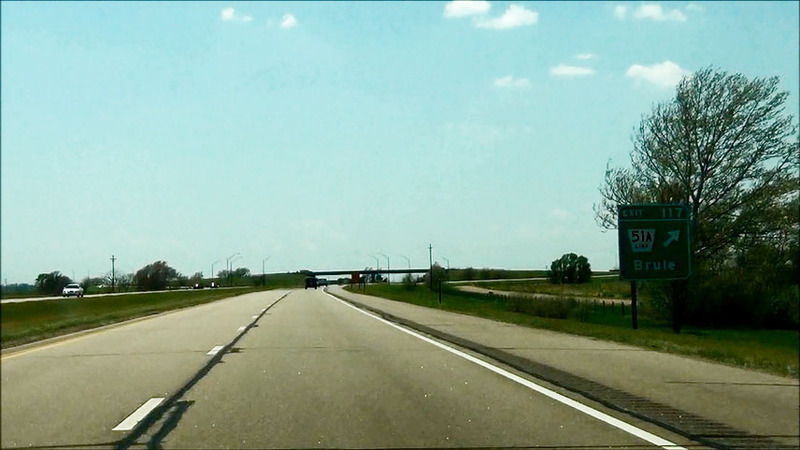 Interstate 80 West: Road view from mile marker 14. (Photo taken 5/17/13). 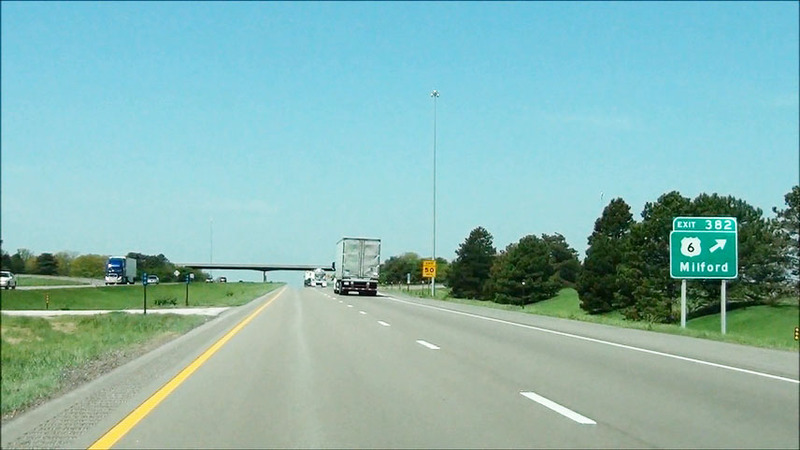 Interstate 80 West at Exit 8: Nebraska Link 53C - Bushnell (Photo taken 5/17/13). 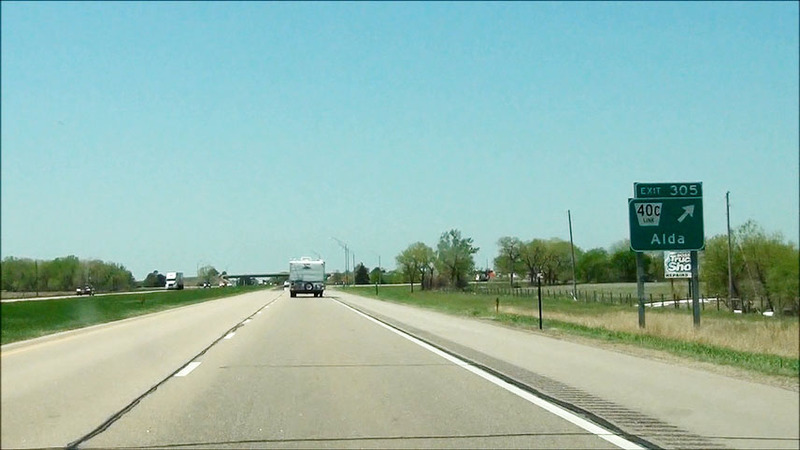 Interstate 80 West: Road view from mile marker 4. (Photo taken 5/17/13). 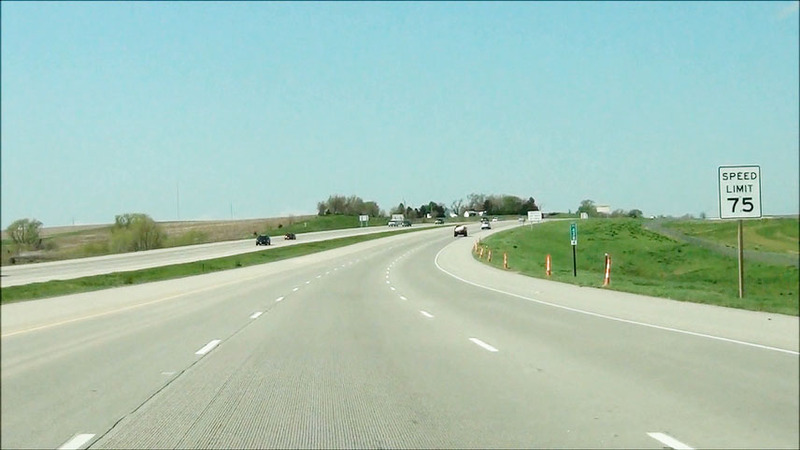 Interstate 80 West at Exit 1: Nebraska Link 53B - Pine Bluffs (Photo taken 5/17/13). 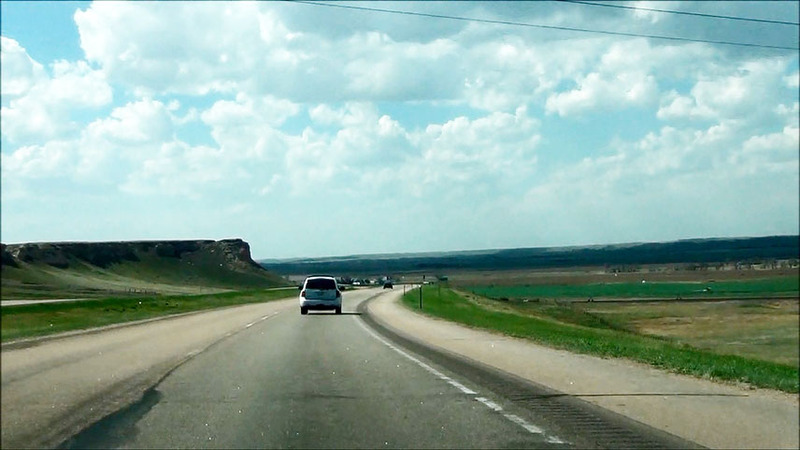 Interstate 80 West: Road view from near mile marker 0, as I-80 prepares to enter Wyoming. (Photo taken 5/17/13).